Oh yeah…I forgot this dude was in the car. 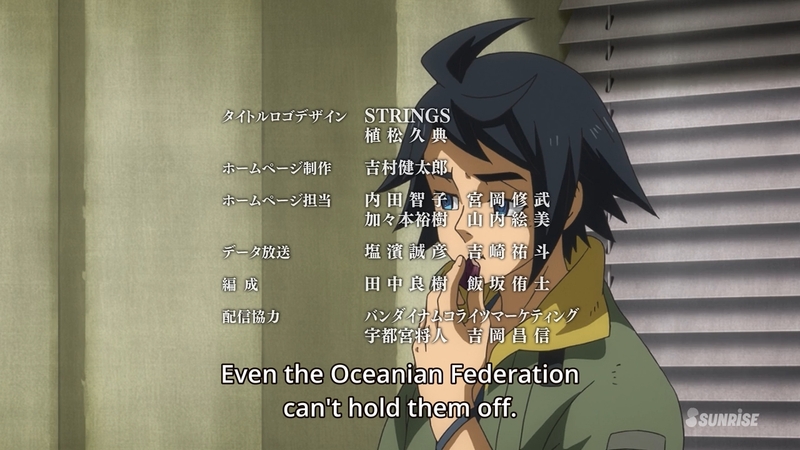 I agree…we have so little time, we can’t even play the opening song with the whole opening animation. Got to save those frames! 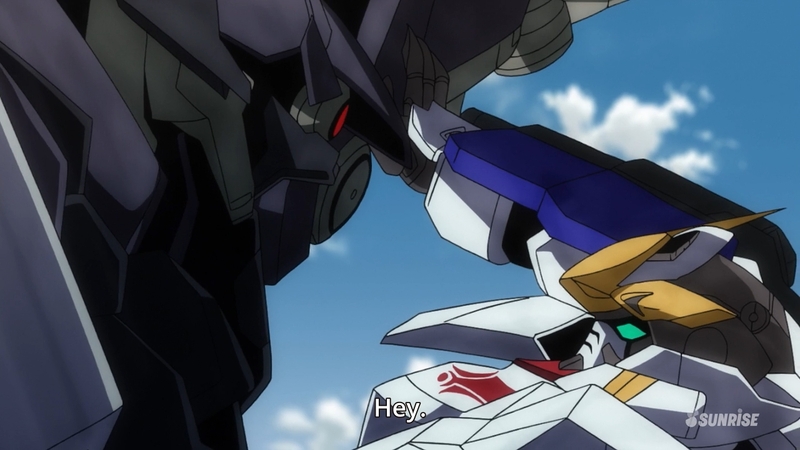 Wow…Gaelio is getting spanked. 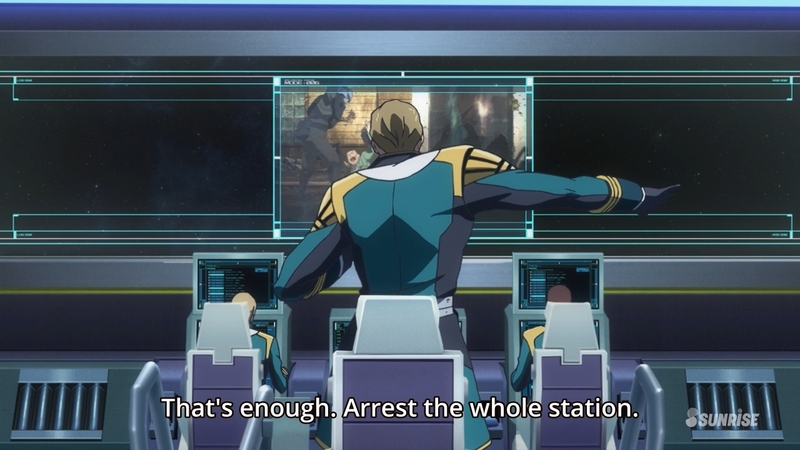 Isn’t he piloting a Gundam? 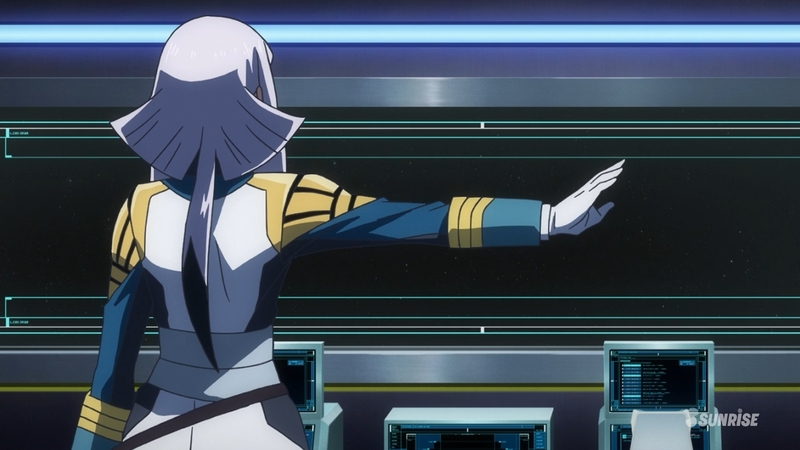 Is McGillis using a Gundam too? 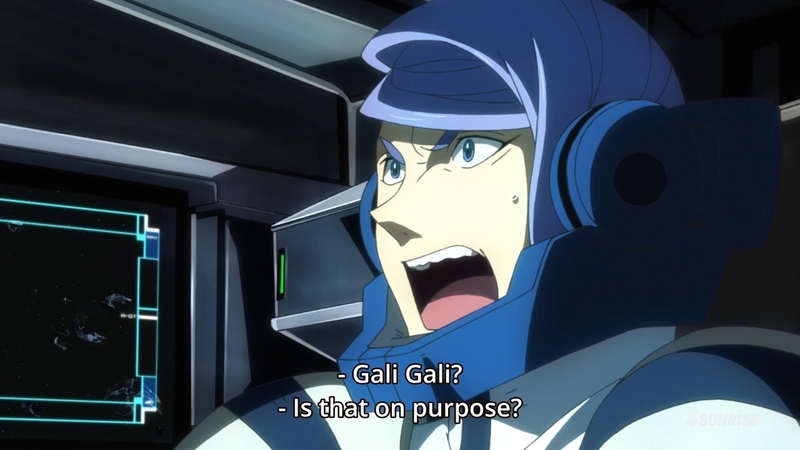 Also, I thought McGillis was talking about using Carta and Gaelio for his vision of the new Gjallarhorn. Does he not care if both of them die? Aww man…why does this guy get to live? He was asking for it! 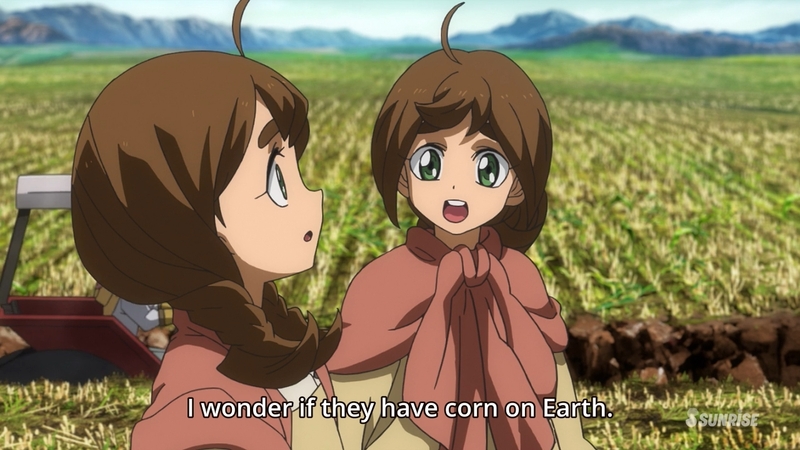 Don’t say that, Ein! You’ll activate the power of friendship! These characters are made of steel! 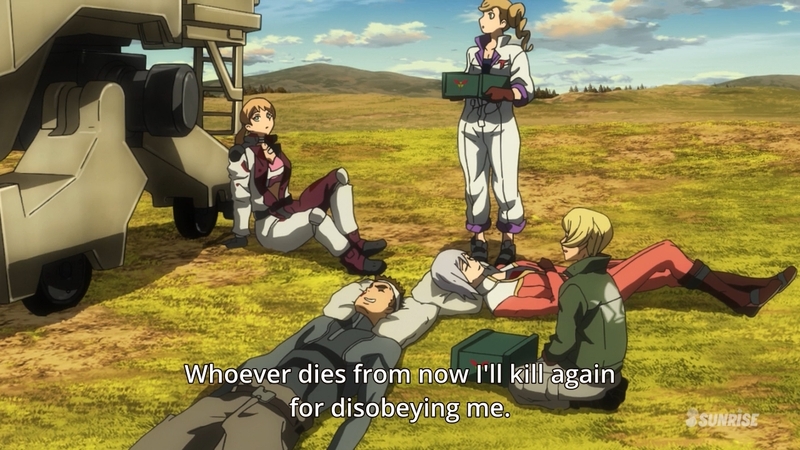 *facepalm* Orga makes the same mistake that got Biscuit killed…I get the feeling he won’t be punished for this, but he really should. Oh hey…guess that’s done. Why did this fight feel so short? His eye can’t see and arm won’t move…yeah, we’ll call these congratulatory head pats. Season 2? I suppose there’s plenty of room to have another season…we’ll see how it goes. 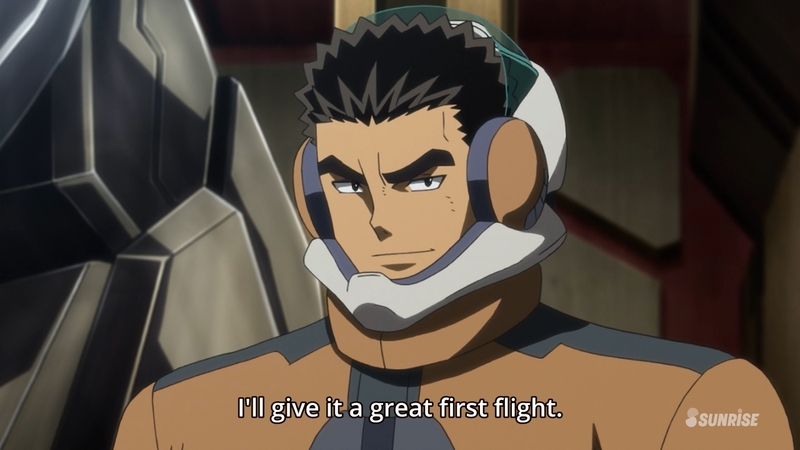 I’m still pretty pissed off that we don’t get to see much of Akihiro in action, so maybe the second season is where he shines! When did all of these injuries happen? 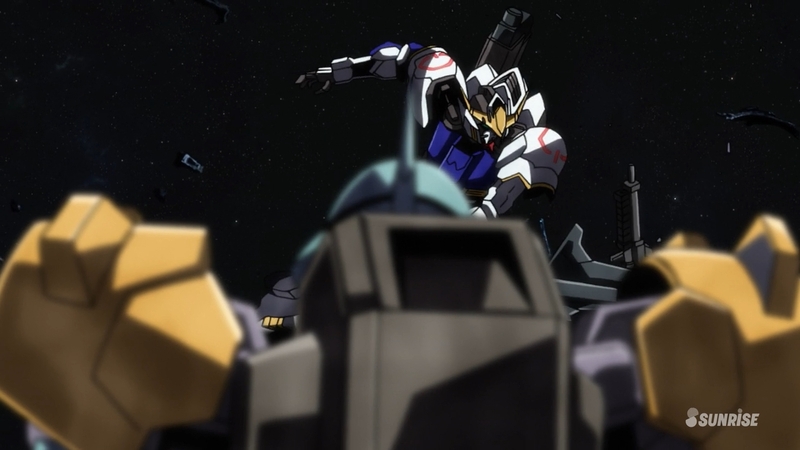 Last thing I remember was Mikazuki taking out three mobile suits by himself. Did we miss something? 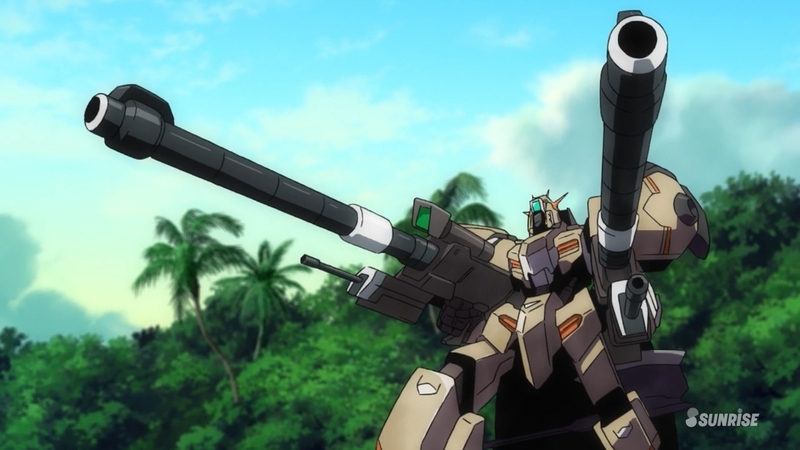 I feel like we don’t get to see the Gusion Rebake in action enough…he was relegated to the sniper post in the last big encounter. 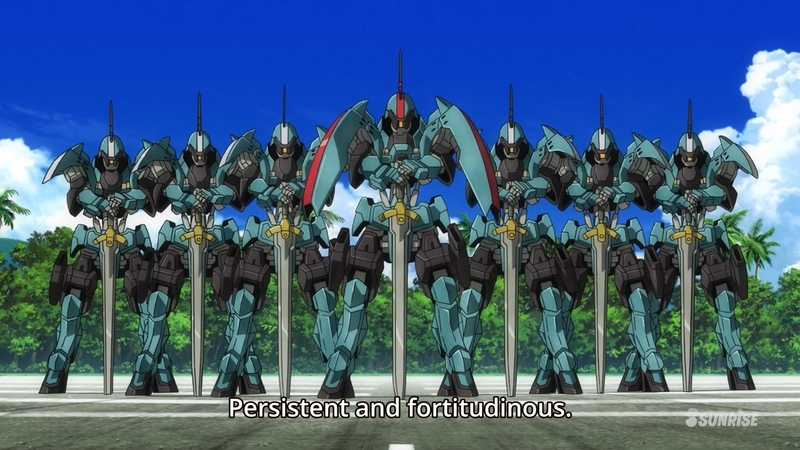 These guys are like me…wishing that Mikazuki would just cut through the defenses with their mobile suits. 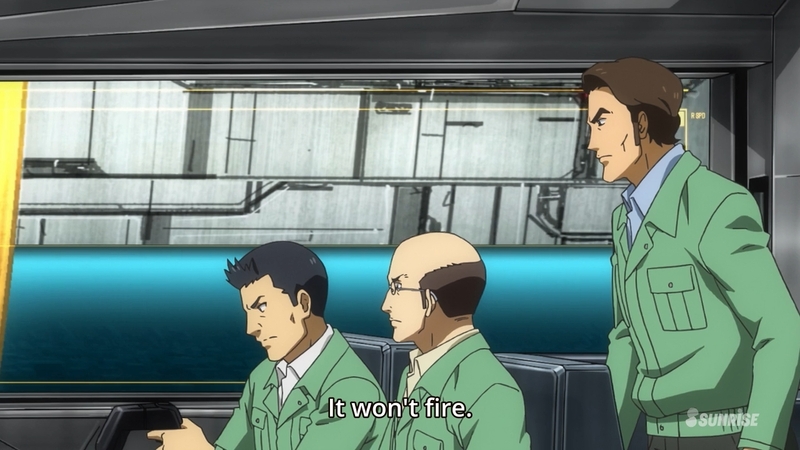 But I get that they aren’t supposed to use Ahab Reactors in the city. 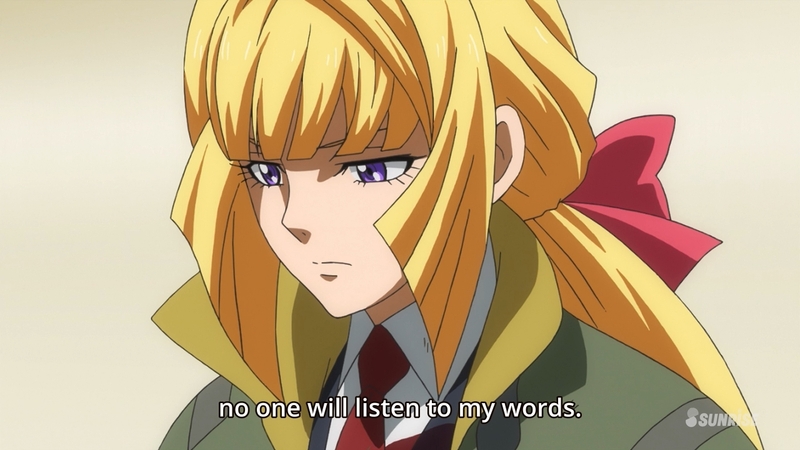 So…you’re basically saying “we’re going to trigger as many death flags as possible in this episode”? 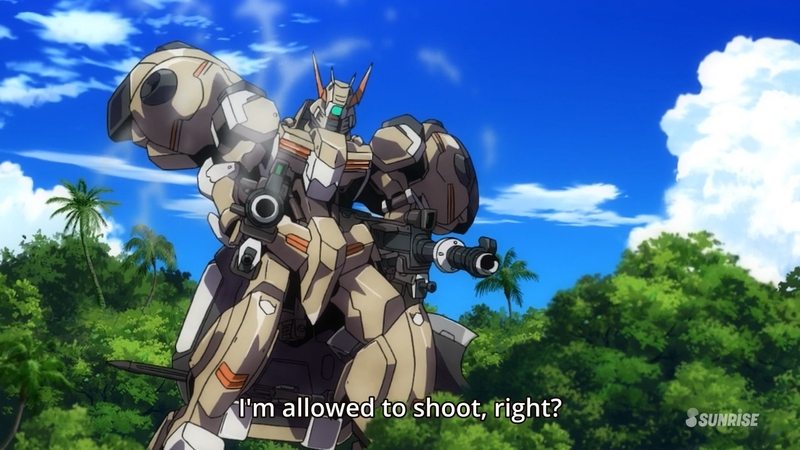 Am I supposed to agree with Orga’s way of doing things? Because I really don’t feel it. 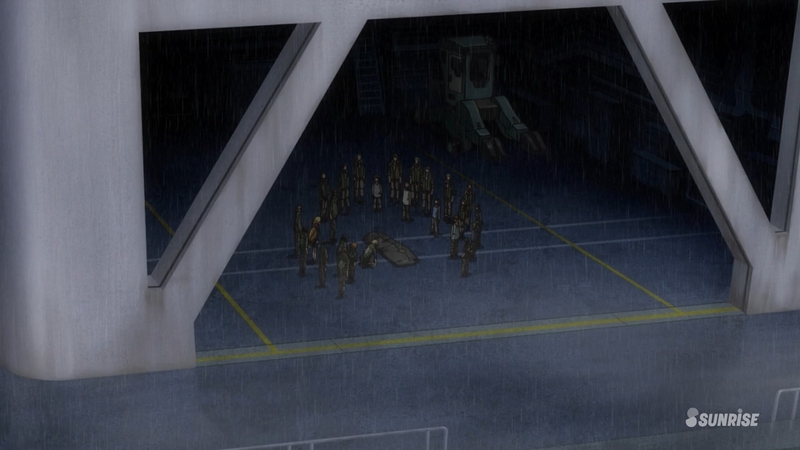 Children dying for a cause…I feel like this was the beginning of Gundam 00. Why is this reversed here? This kids just became kamikaze warriors…jeez this is a slaughter. Eugene’s here to save the day! 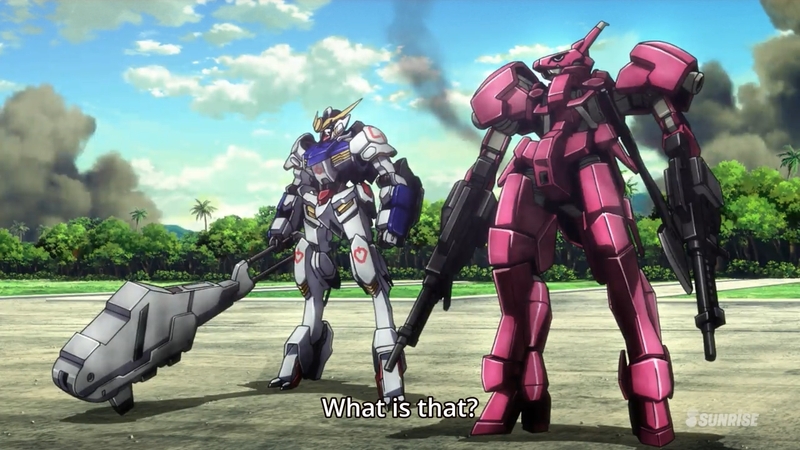 The oversized Mobile Suit archetype has always been my least favorite. Lafter AND Azee? 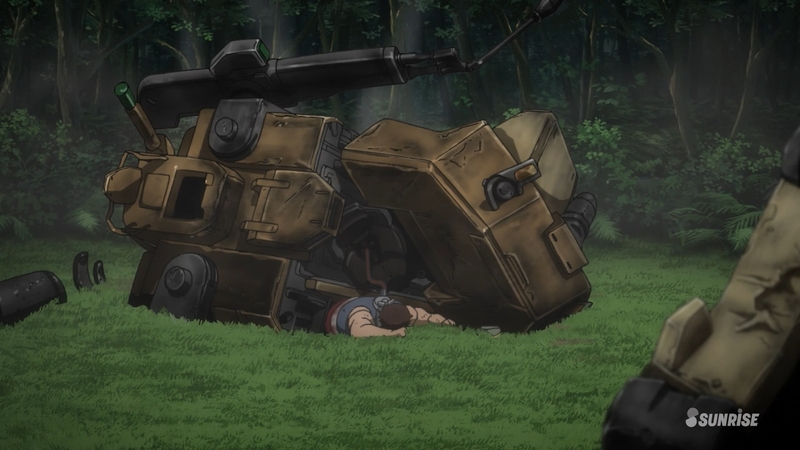 I would have expected at least one of them to survive…I guess Akihiro is really cursed. 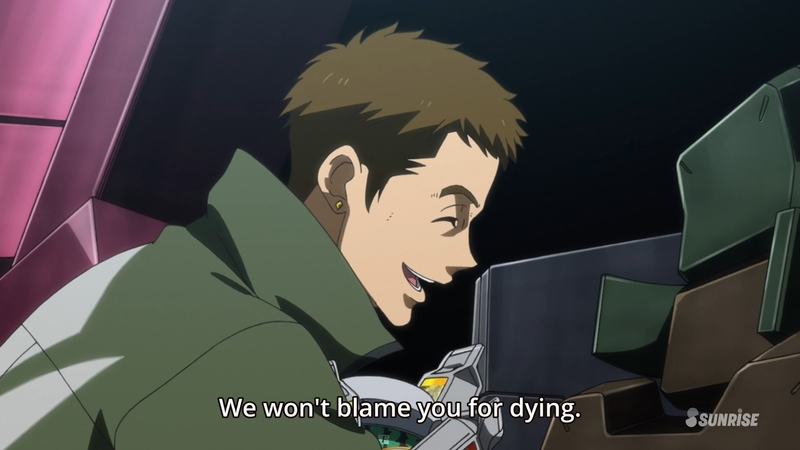 I don’t really have a problem with Shino dying…he’s been telegraphing it for a while now. 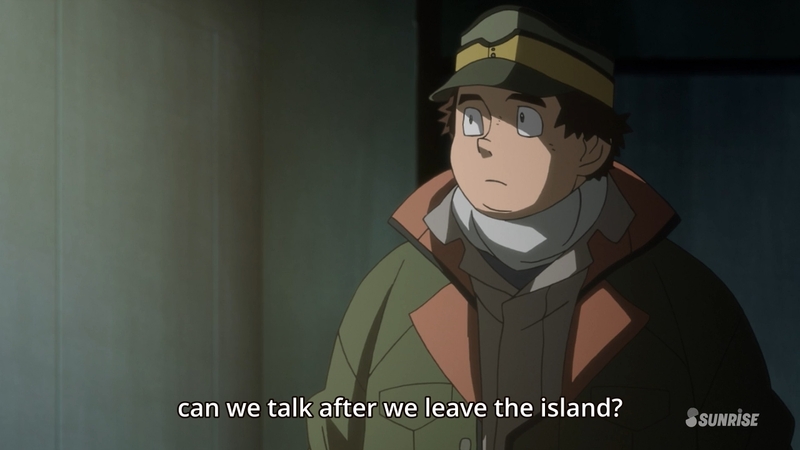 I kinda expected Ein to go nuts before the end of the series…he seemed like the type of character that would. 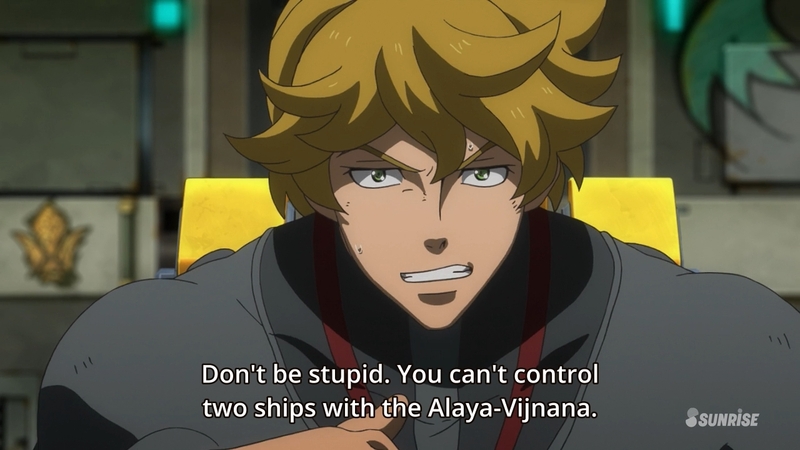 But I feel like I should have a problem with him seemingly going nuts after getting the Alaya-Vijnana system installed…he was unstable before and now he’s just suddenly a lunatic. 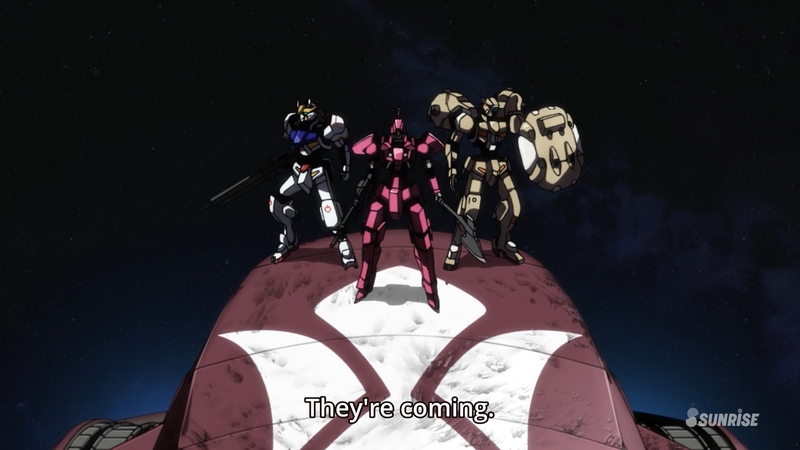 Char, I think your mobile suit isn’t looking red-enough, but maybe it’s just the light. 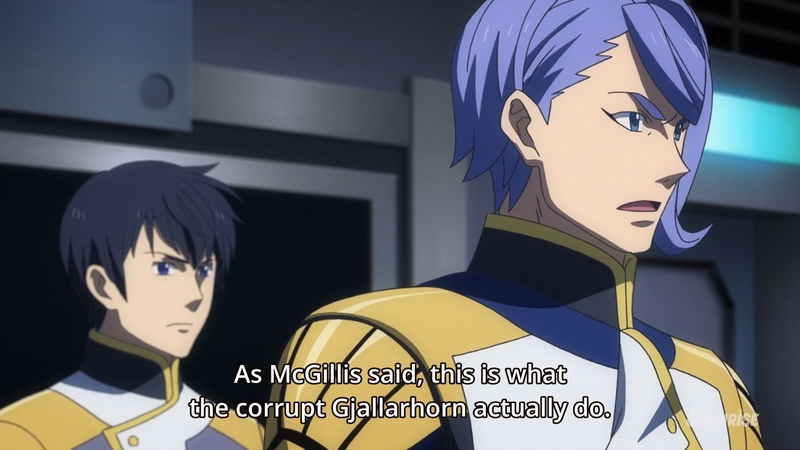 That being said, it’s weird that McGillis is facing off against GaliGali given how McGillis was talking about him before…perhaps he’s trying to knock some sense into him so they can team up to take on Gjallarhorn together? 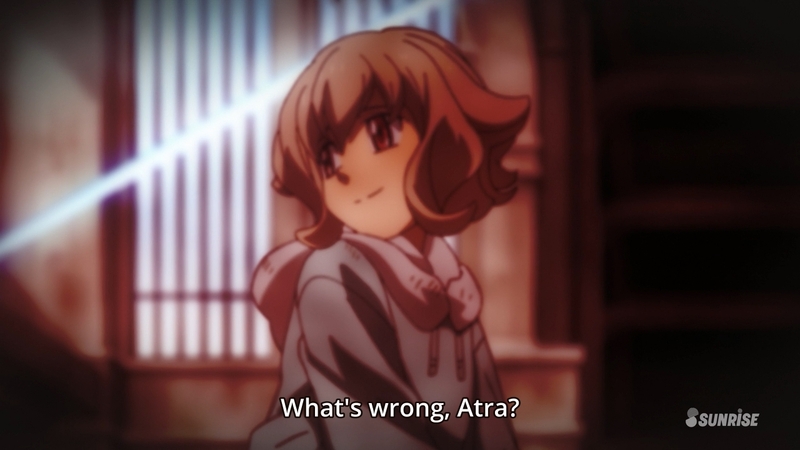 Well, I honestly thought this was Atra’s place to die, but it made no sense when she tackled Kudelia down. 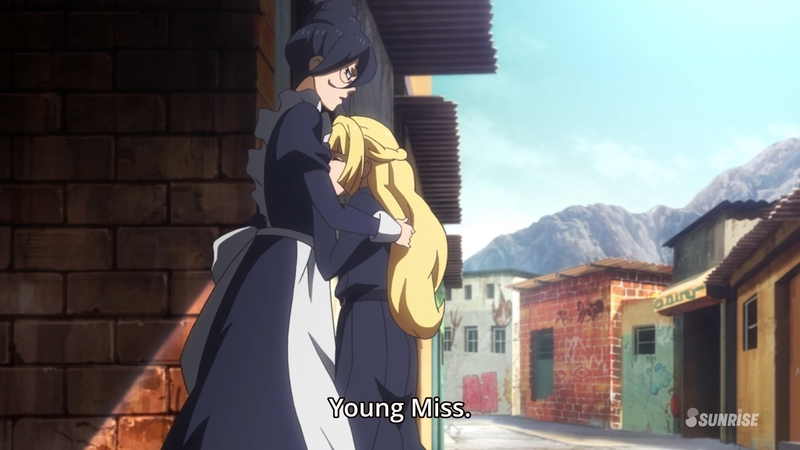 There’s no way her body would be enough to stop that axe…good thing Mikazuki was here in the nick of time! Next week, the final battle! How many will survive? 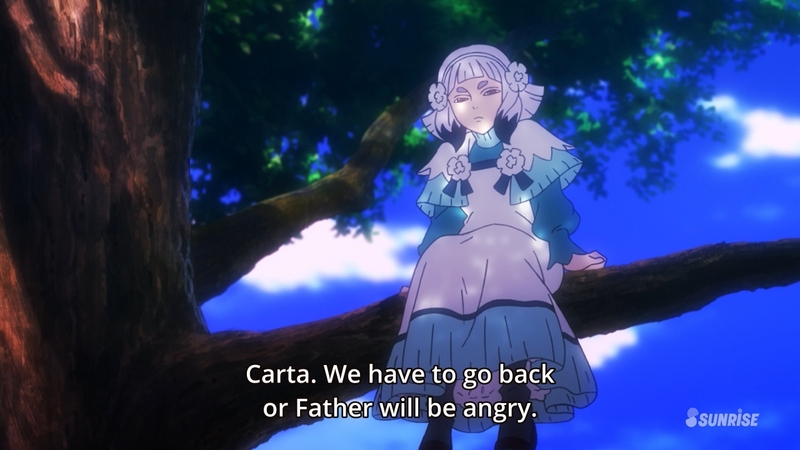 You’ve failed me for the last time, Carta. 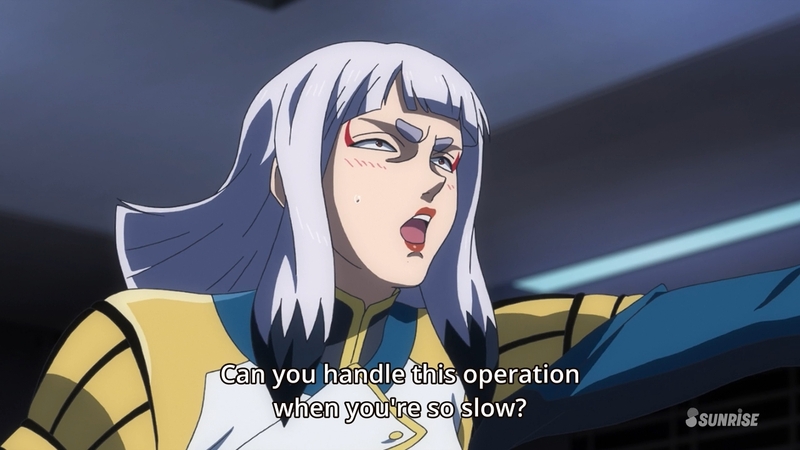 Maybe I’m just extra tired today, but for some reason, I noticed the fact that Carta’s mouth moves in this scene even when she’s not actually saying anything. 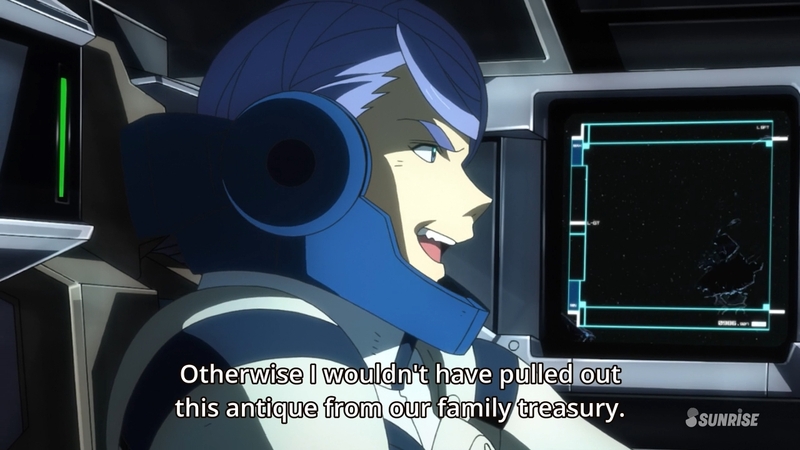 Yeah, that’s why I gave a ship to those guys you were trying to fight! To help you! I mean…this is true, but Merribit has a point. There’s a reason we don’t generally allow children to make many big decisions without parental guidance. Plus, that’s not the point she’s trying to make. 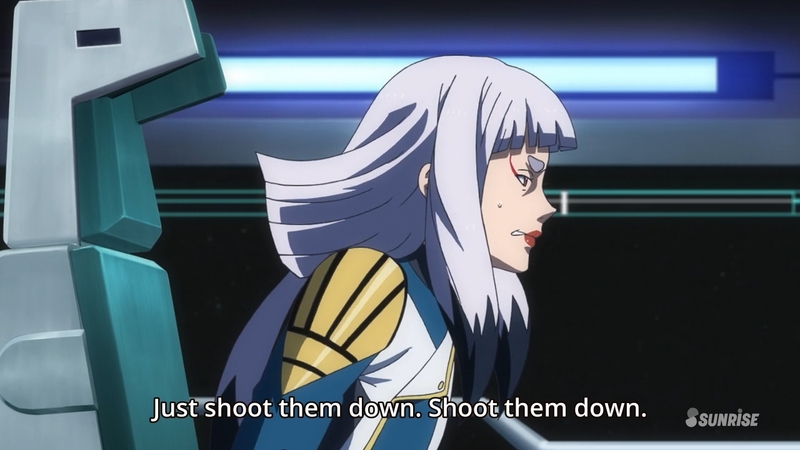 I’m sure she’s more saying that the atmosphere that has been created by cries for vengeance are what’s dragging the kids in…at least I hope that’s what she’s saying. See? 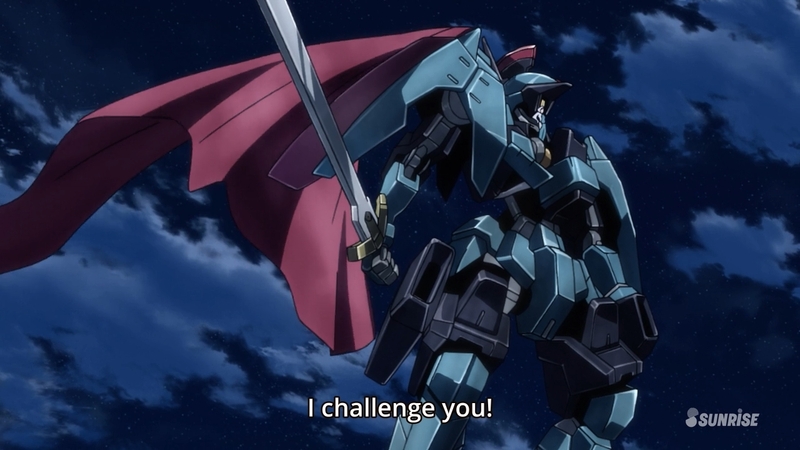 Mikazuki doesn’t care about your silly challenge. Although this may be more because he knows she was the one that killed Biscuit. I mean…he is fighting you 1v1 right now. How fair do you want this to be? 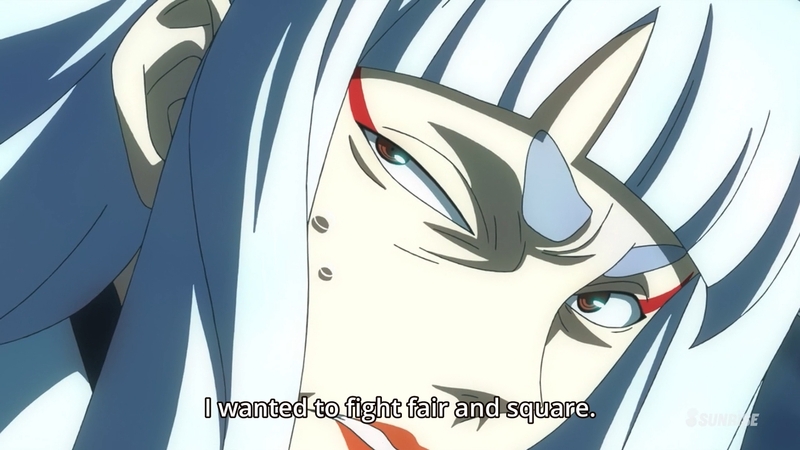 You just lost your initiative by posturing like a dunce. This shot is pretty awesome. Doesn’t this scene seem strange? 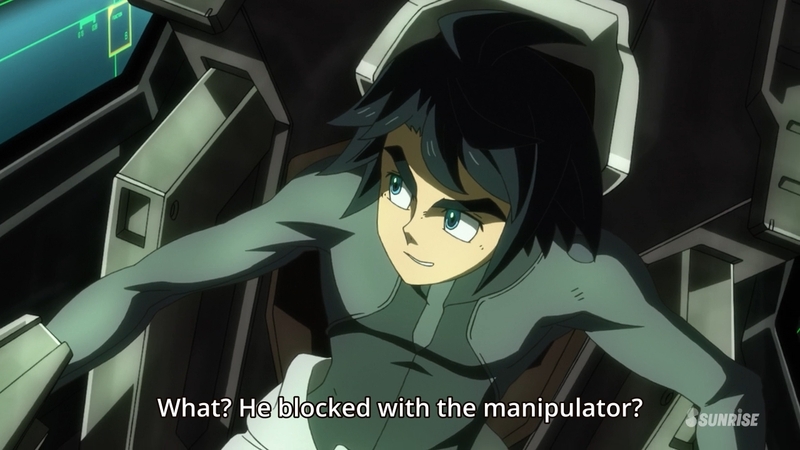 Mikazuki attacked Carta without hesitation and killed Crank without even letting him finish a sentence. 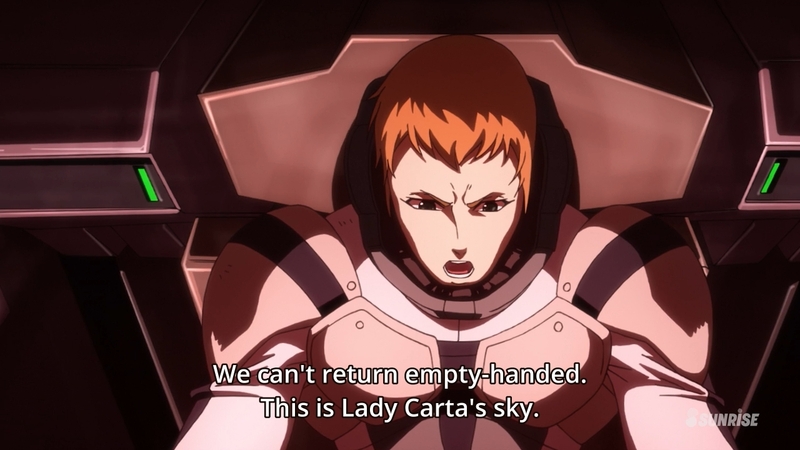 Why is he rationalizing killing Carta here? He’s basically allowing himself to be interrupted by GaliGali. 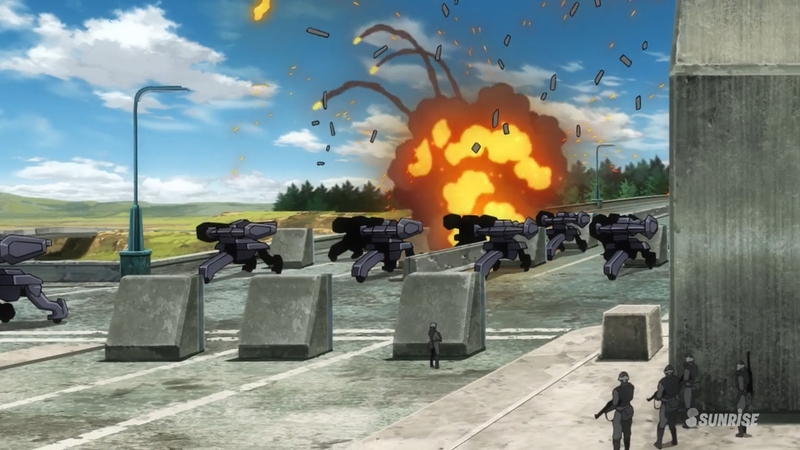 Anyway, next week’s episode looks to be a larger-scale battle. 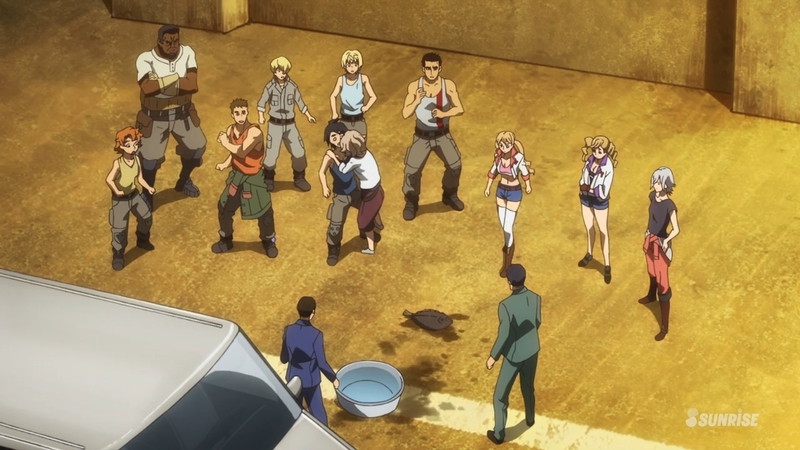 We’ll finally get to see Ein in action! Starting off with the aftermath of last week’s battle. We’re pretty close to the end of the series, so I’m hoping this doesn’t drag on too long. I mean…that’s kinda your fault, isn’t it? Why are you getting pissed off at this guy? Ugh…please tell me no one actually thinks like this. Of course, I have no idea just how much of the nervous system is augmented when the Alaya-Vijnana system is implanted, but I still see no reason why it, in any way, dehumanizes the host. Seriously…what’s the difference from that and any kind of prosthetic limb? 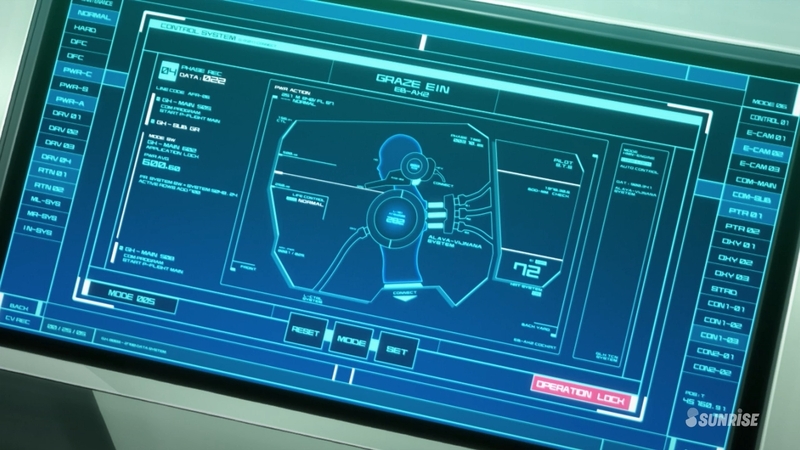 22 episodes in and we finally find out the origin story for the Gundam units, which were apparently designed specifically to work with the Alaya-Vijnana system. 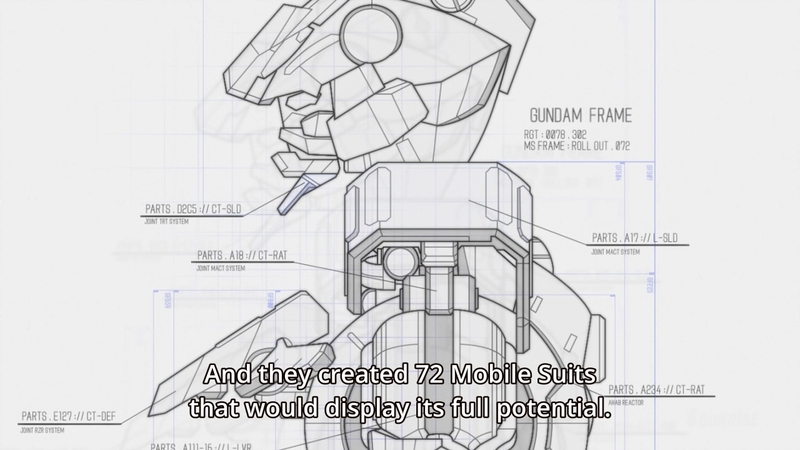 But holy crap, there are 72 of those things? We don’t have enough episodes to discover them all! 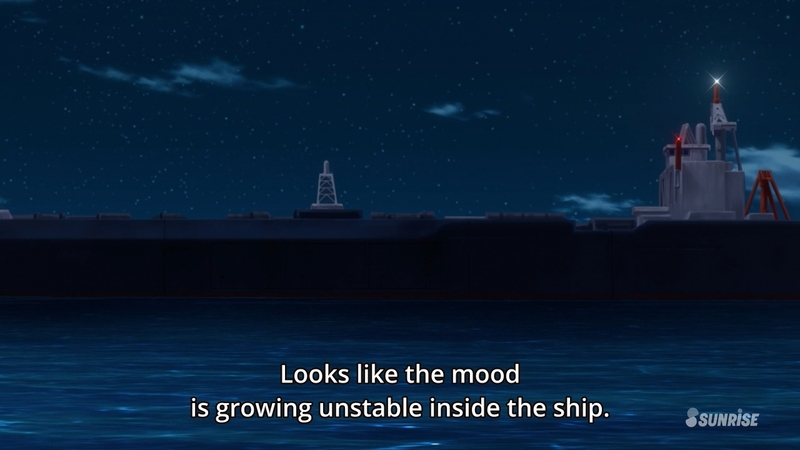 So I get that they’re all dealing with their depression and all, but when did they get on this ship? 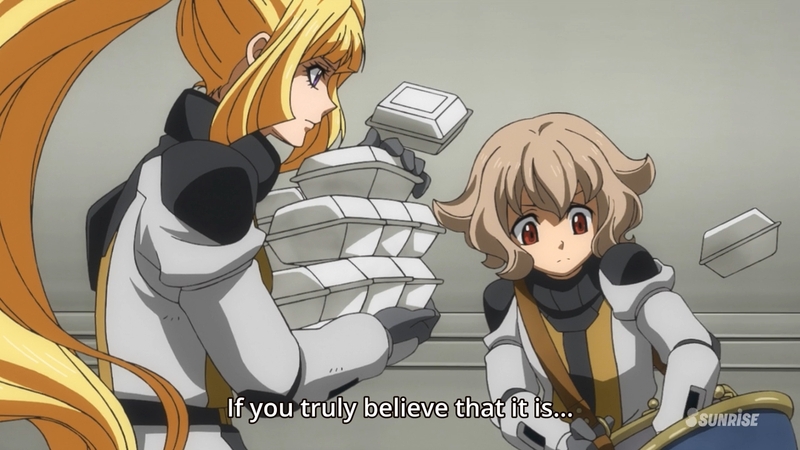 That was supposed to be the final goal of the operation last week…I guess after the Biscuit death scene, they were able to all compose themselves enough to get to the ship? 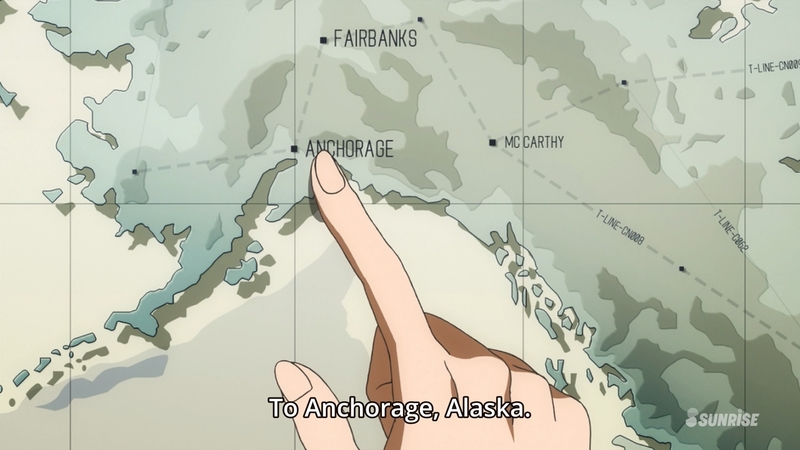 We must get to the Alaska base! She really has come a long way…but is the change too drastic? Meh…I disagree. 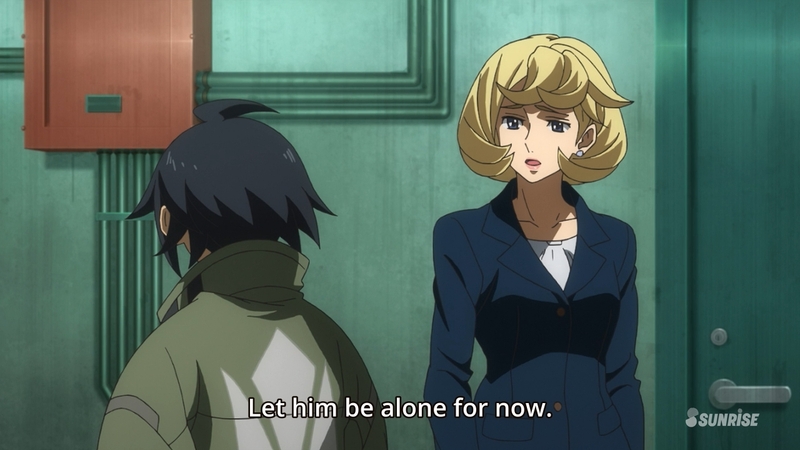 You can appeal to his emotions and Mikazuki can appeal to his rationality…one of you should really be talking to him. 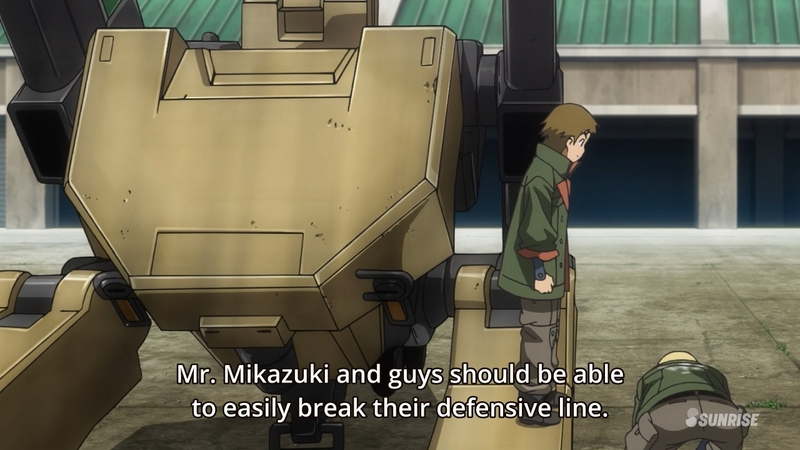 Mikazuki is brutal as always. I suppose this was the only way to snap him out of this. Next week, we get back to the fights. 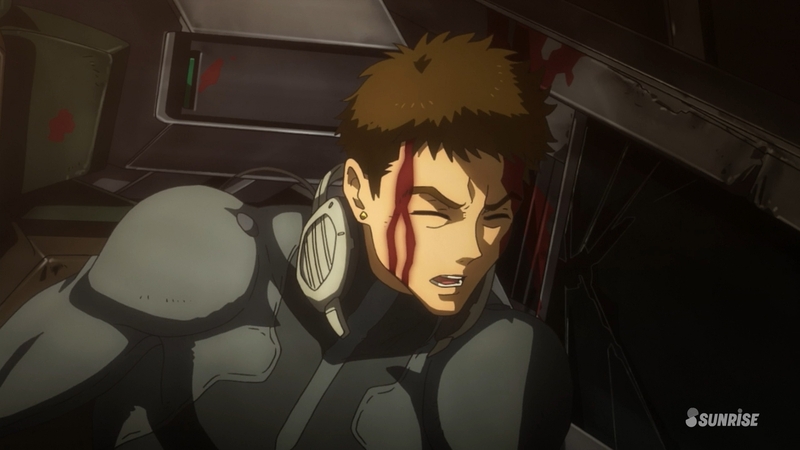 I wonder if Ein will be showing up with his new capabilities…it’s possible he only shows up at the end of the last episode Graham Aker style. Quick reminder at the start of the episode that Biscuit has more family members on his mind. 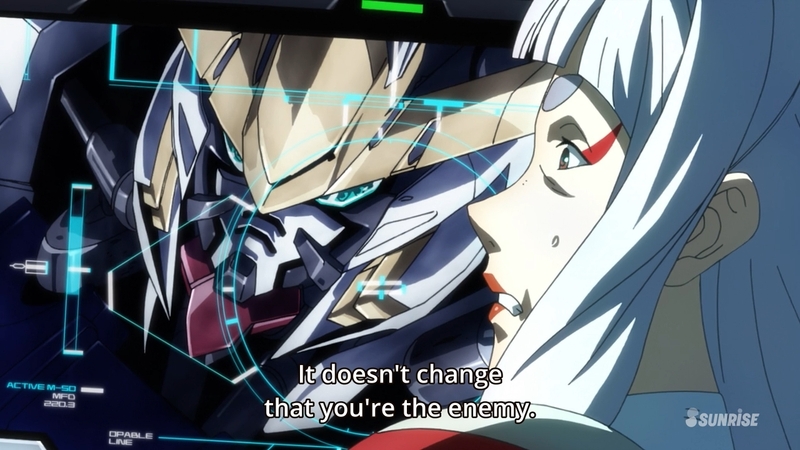 How long are they going to draw out his disagreement with Orga? Let’s all agree that a family with the last name “Issue” is a bit ridiculous. 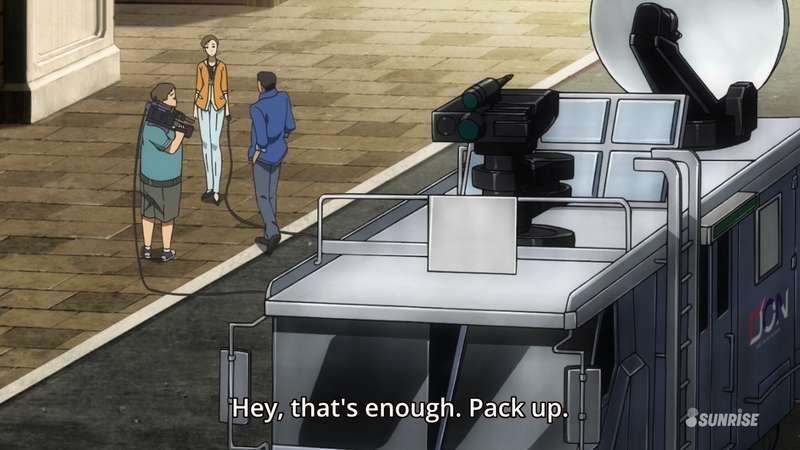 Please tell me this is just translators having some fun. Seems like the only plan available. 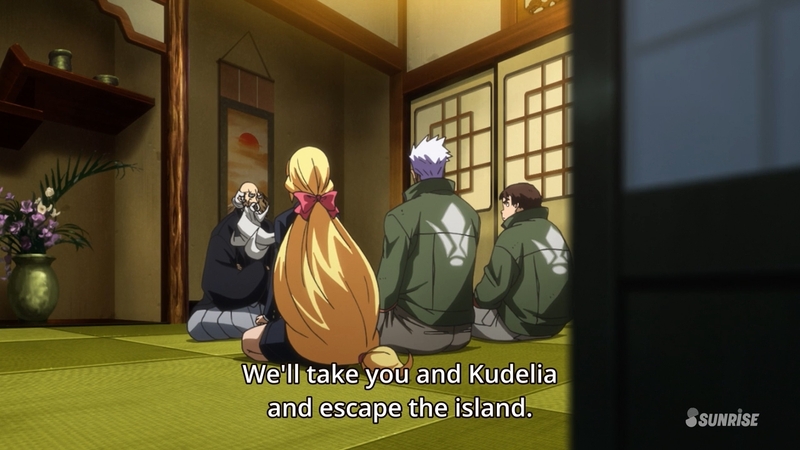 Not sure how Kudelia plans to get a ship, though. 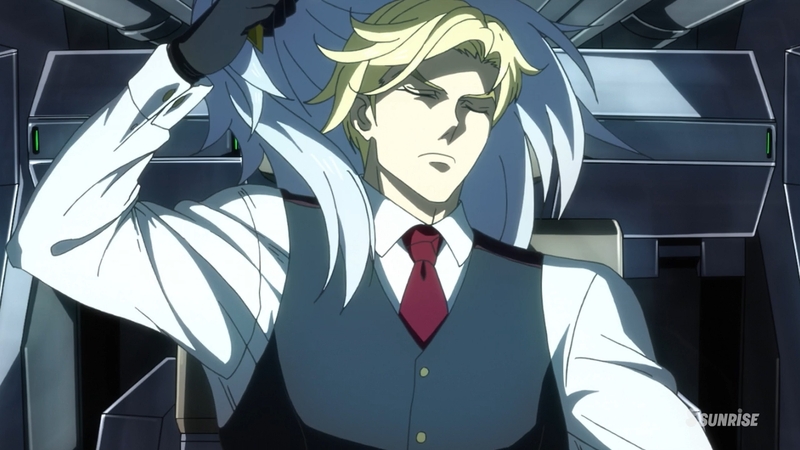 Ask McGillis? This guy tries to cheer up the gloomy guy with pretty empty promises. 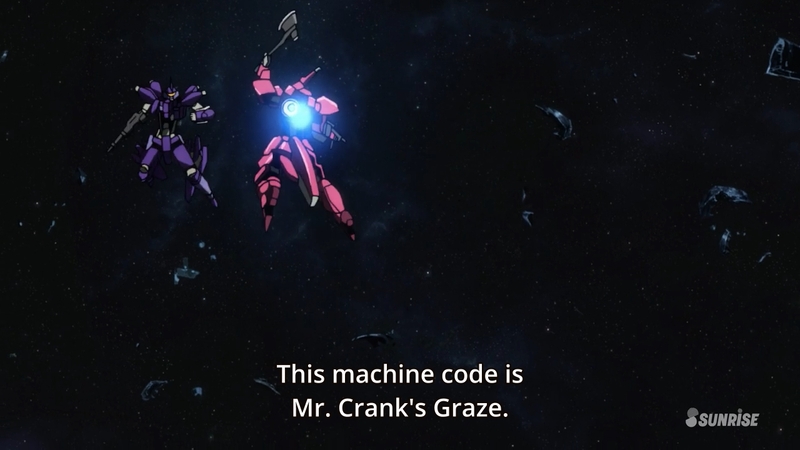 He’s the pilot of the rebuilt Graze, right? This feels like a pretty big death flag. 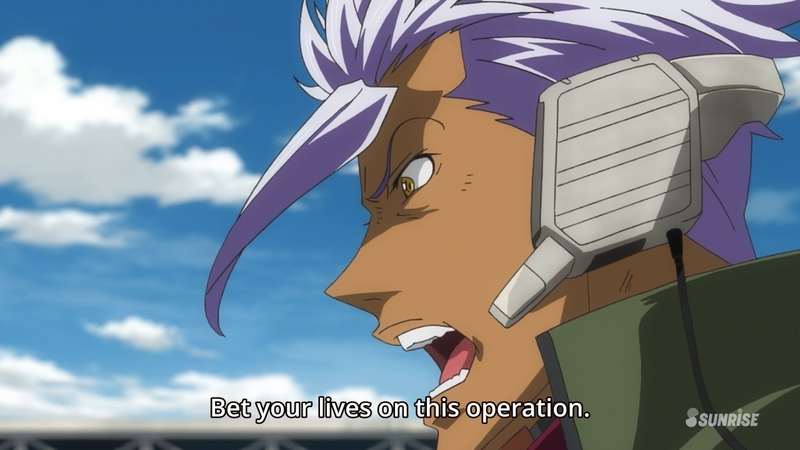 Promise to talk about things after the big battle suggests that Biscuit or Orga will die. I know I’m raising a lot of death flags, but this is probably the last major battle of the series, so anything is possible. Saying “I couldn’t tell him” feels like a setup for saying “and now I’ll never have the chance”. 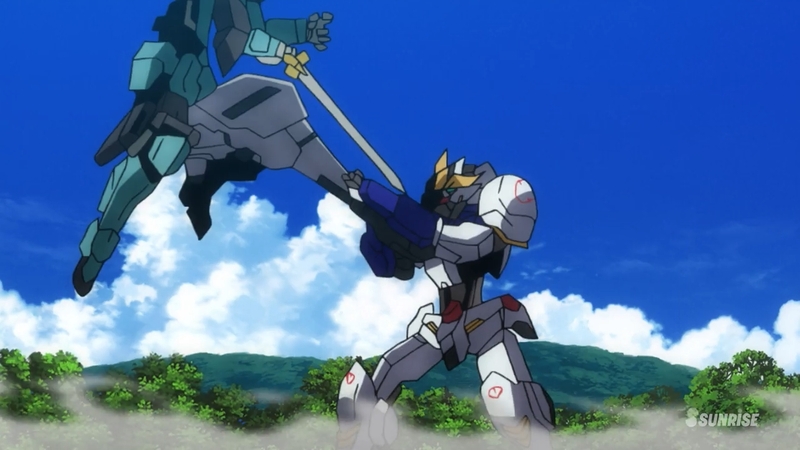 I love that Mikazuki would rather use what looks like a blunt object rather than use a katana. 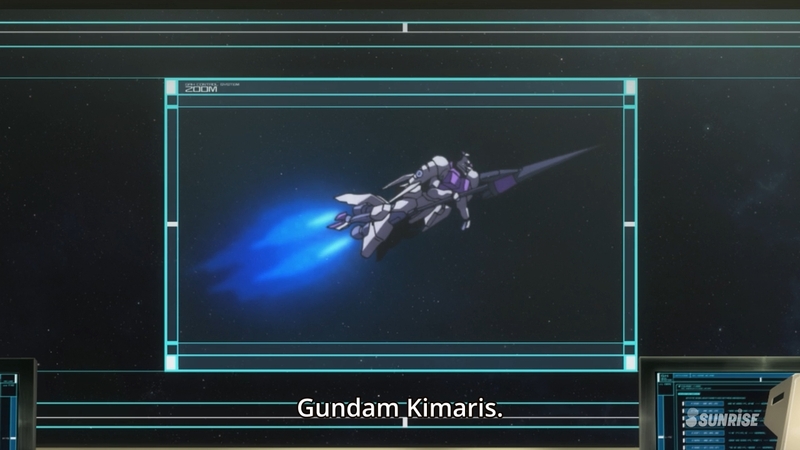 They’re really shoving into our face the fact that beam swords are unlikely in this world. 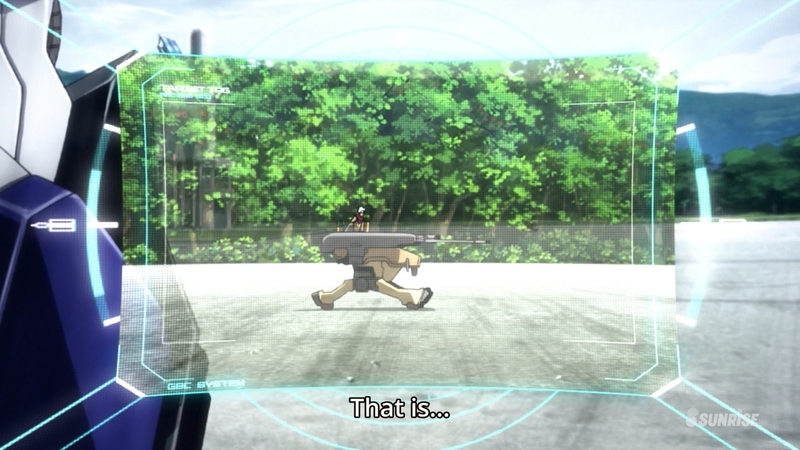 Akihiro as a sniper seems really unnatural…but this scene was still cool. 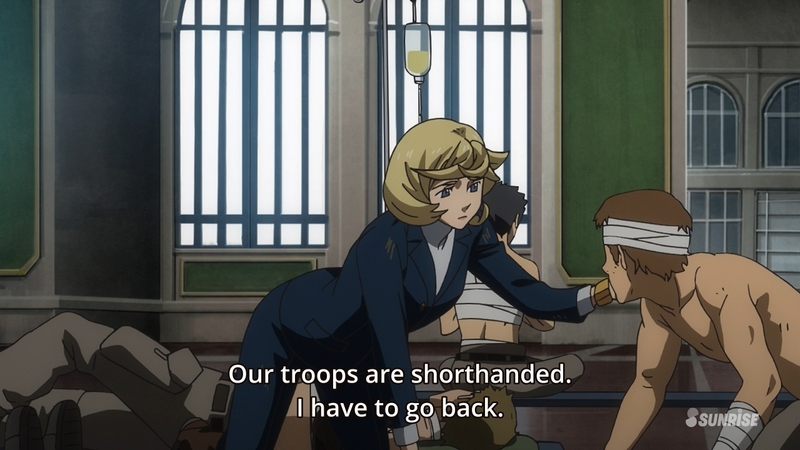 Carta’s really lucky Akihiro’s on the shore…otherwise, she would have been shot for doing this. HAHAHA! Never mind, then. 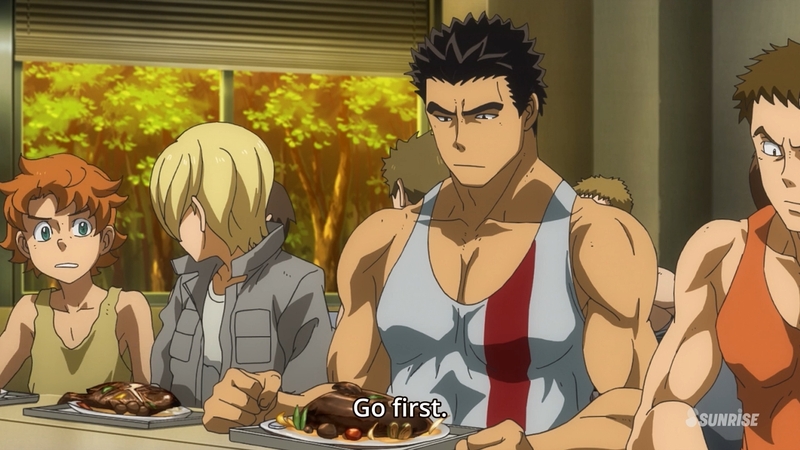 Akihiro knows exactly what I’m thinking. Thanks for the punish! 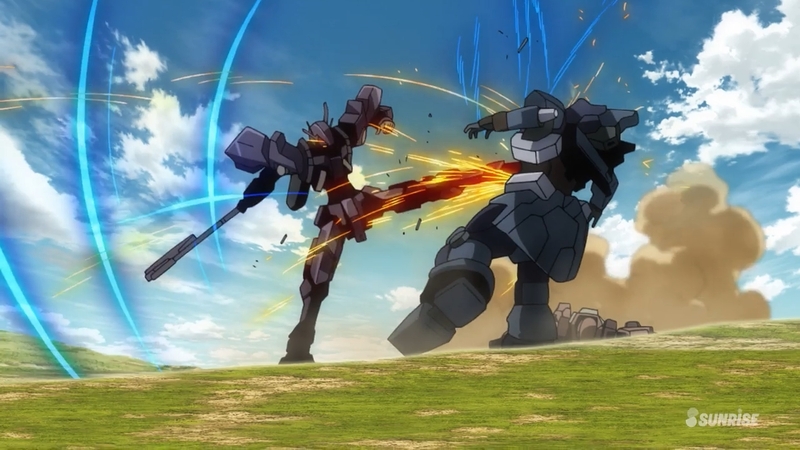 Did Mikazuki just break their formation with a nut shot? 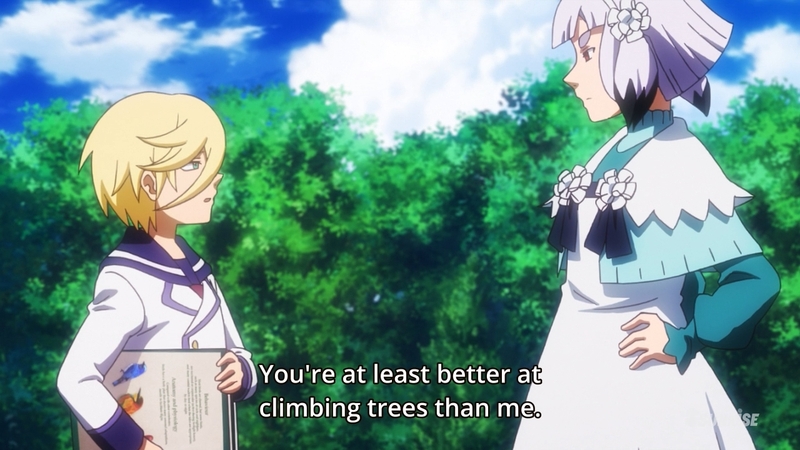 This episode just isn’t taking things seriously, is it? 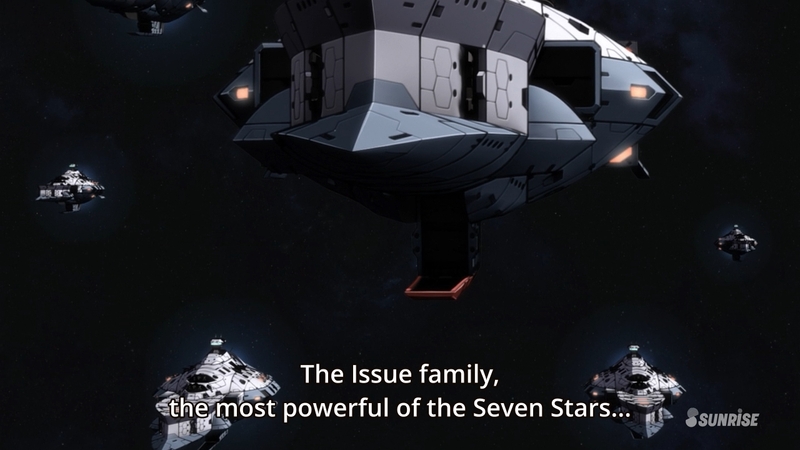 The fact that he’s bragging about how strong they are with the Alaya-Vijnana system makes me feel like something is going to happen to make him eat his words. Is it still too early for enhanced Ein to show up? 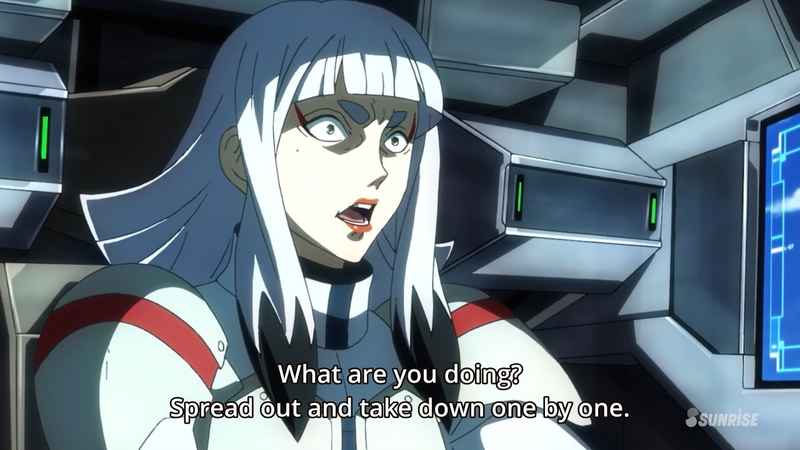 Wait…wouldn’t spreading out be more favorable for simultaneous attack? Wouldn’t you want to group up to focus each target if you were trying to take them down one by one? Ahh…the old “lure them into the exploding house” trick. Nice. 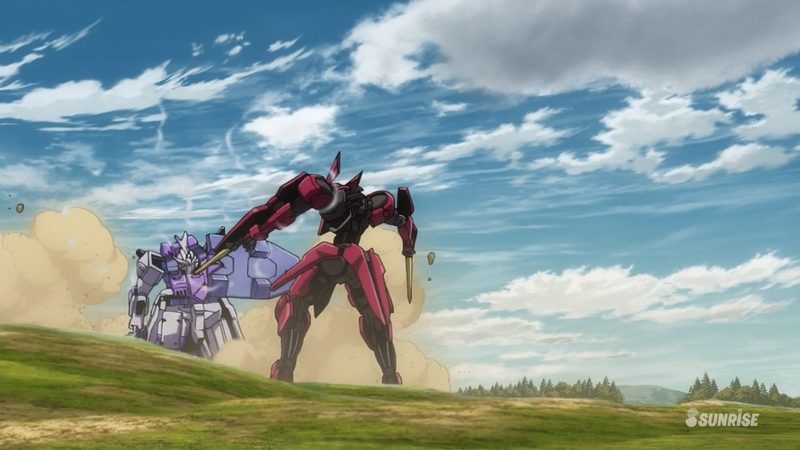 Uhh…Orga, should you really be stopping in the middle of the open runway with no cover like this? This is why you never make promises before the big battle. 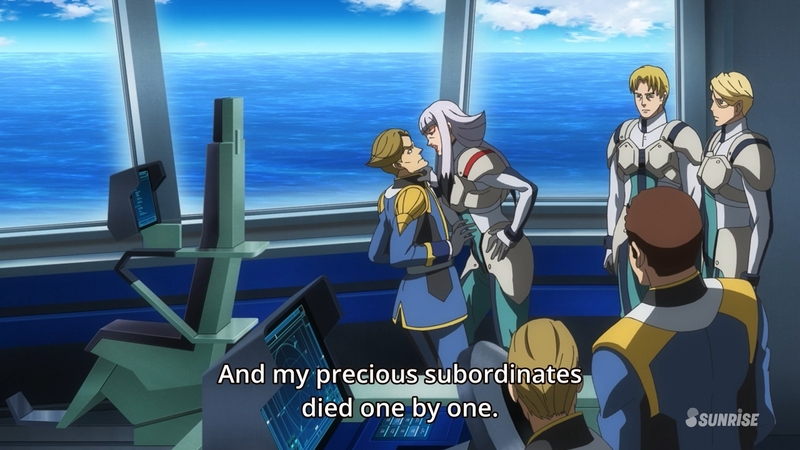 I think the more important piece to get from this scene is the fact that Mikazuki still hasn’t killed Carta. I get that he’s probably distracted with trying to find out what’s going on with Biscuit, but it’s really looking like she’ll survive through this. It’s Earth! 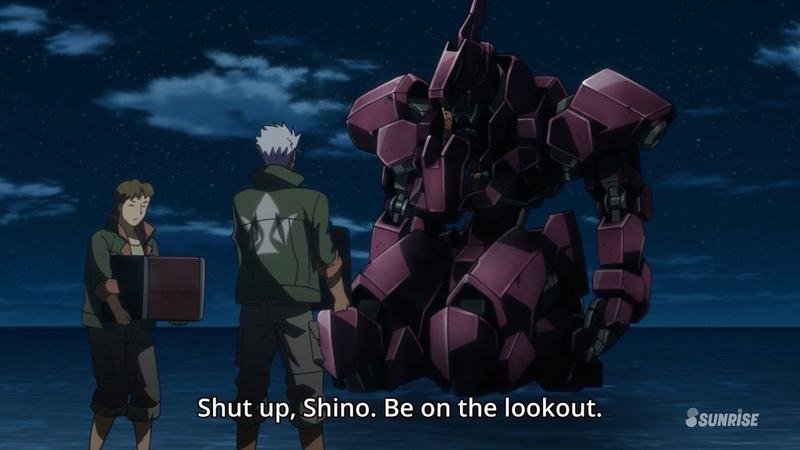 But seriously…how can Shino be a good lookout if he’s looking towards the shore instead of towards the ocean? Does he expect a land assault? 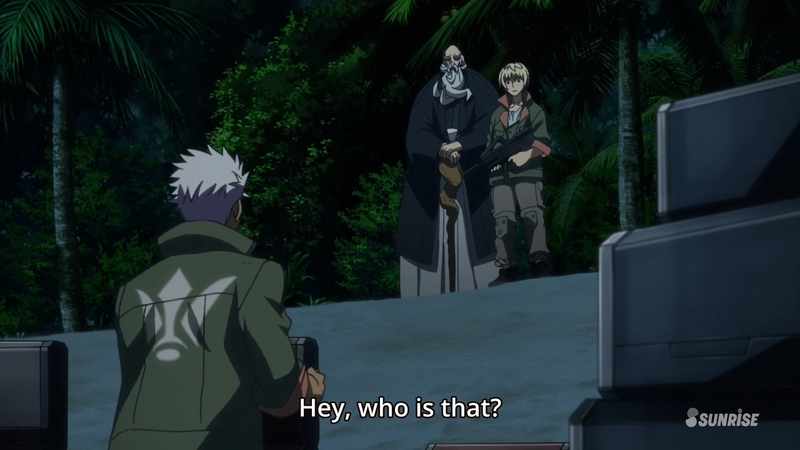 Finally we get to find out who this old guy is. 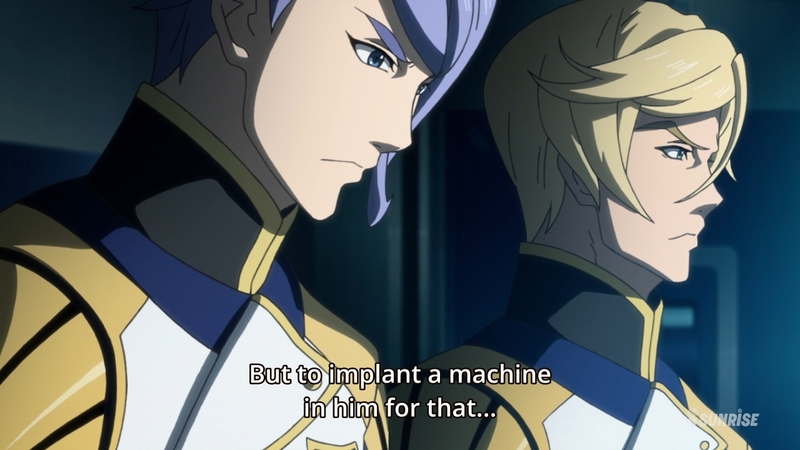 I’m completely on board with turning Ein into a cyborg. 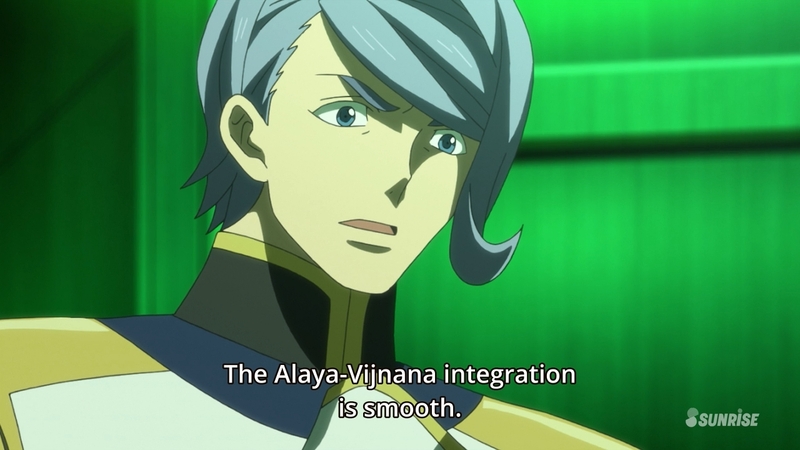 Finally he’ll be able to fight on par with the Alaya-Vijnana system. 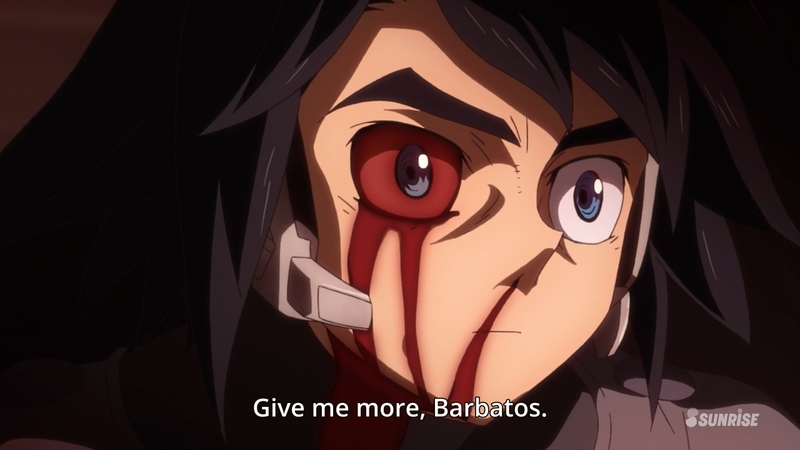 New enhancements for the Barbatos? Woohoo! AHH! THE FISH ARE ATTACKING! Yup…pretty much like I called it last week. 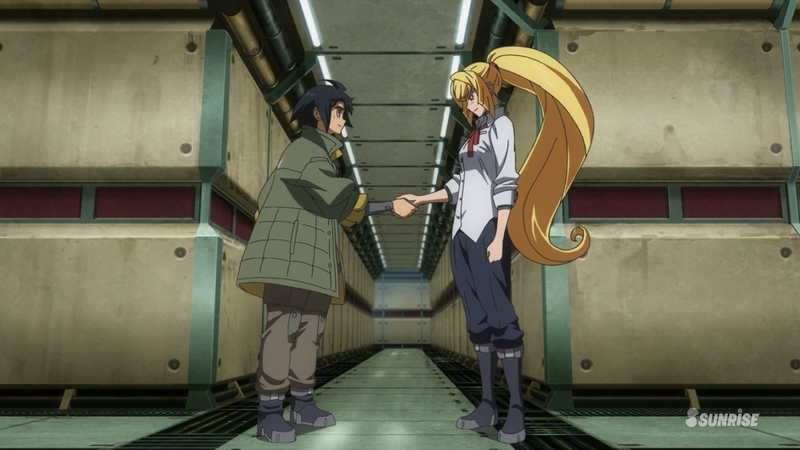 Let’s give Ein the Alaya-Vijnana system! Wait…each of these guys gets half a fish? Just how many fish did they bring? 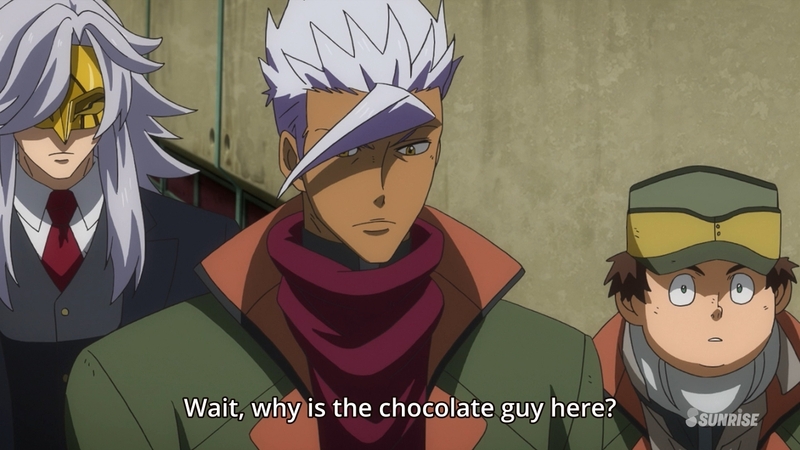 Yeah, Orga…I’d be asking the same thing. 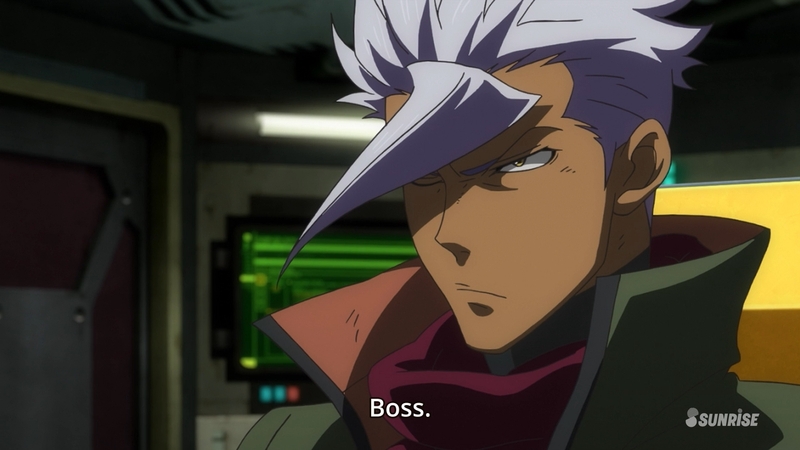 And while Orga and the rest of the group are down on Earth dealing with politics, Eugene is up in space having the time of his life. 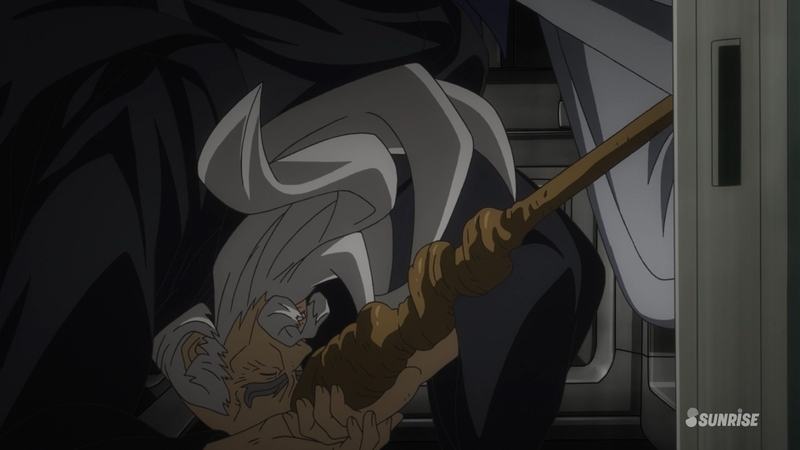 Was this scene meant to further force Orga’s hand? 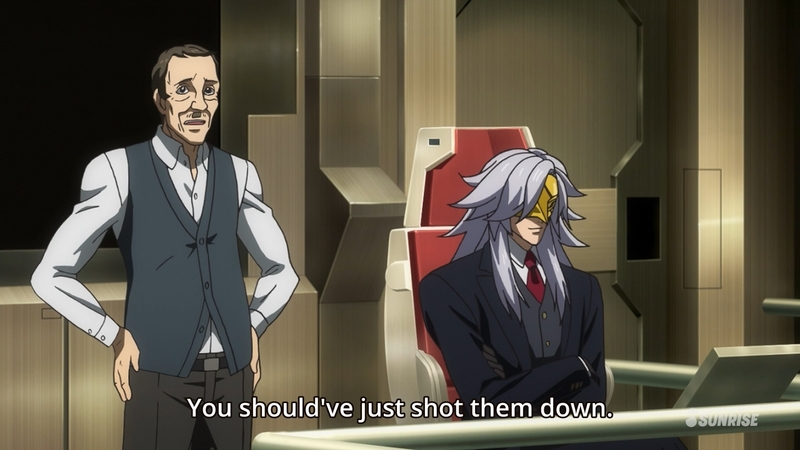 Because if Eugene is currently docked with the Oceanian Federation, Orga can’t really risk getting on the old dude’s bad side, right? 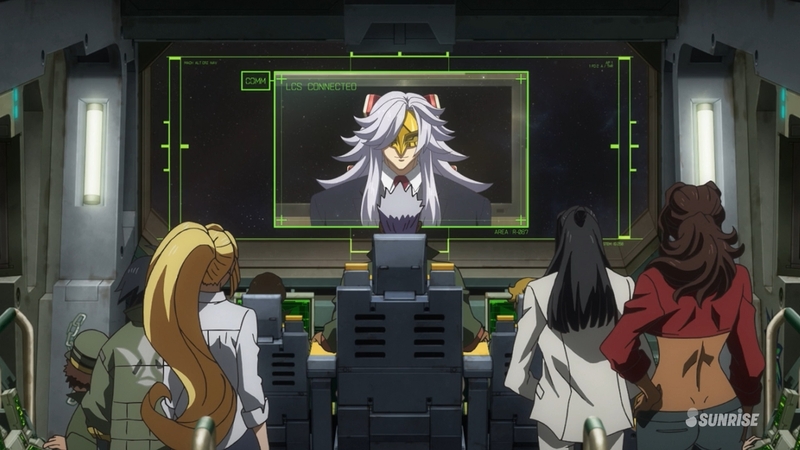 This scene’s not bad…Naze forces Orga to make his own decision rather than using his diplomatic connections as excuses. Time for Biscuit to split with the group? If it’s only Biscuit, then it must have something to do with his brother, right? But Eugene would have noticed if Biscuit was being threatened by his brother, so I’m guessing he got some sort of message from his brother. 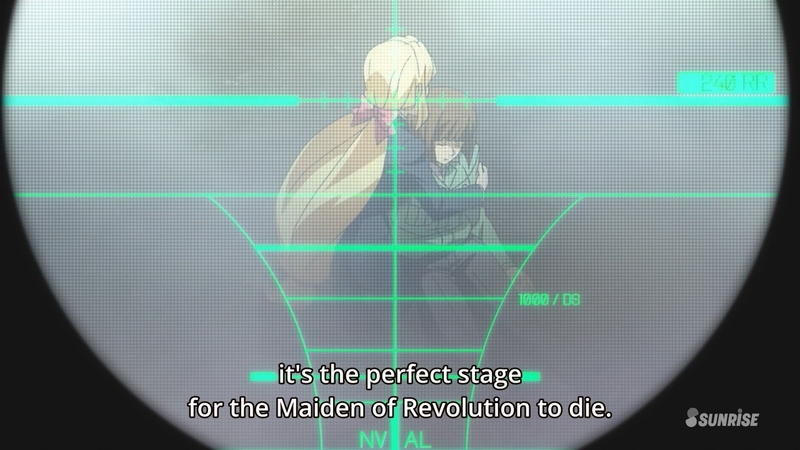 Oh, I see…so Savarin killed himself. 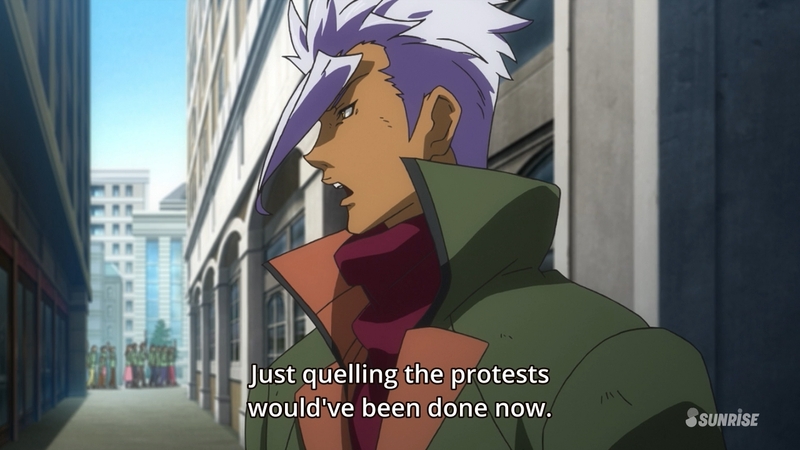 Here I was thinking he was actually going to show up again because of how he appeared in the worker rebellion. I guess Savarin only exists to mess with Biscuit. Oh ho! The parallelism! Surely Biscuit knows that escaping isn’t so easy, right? 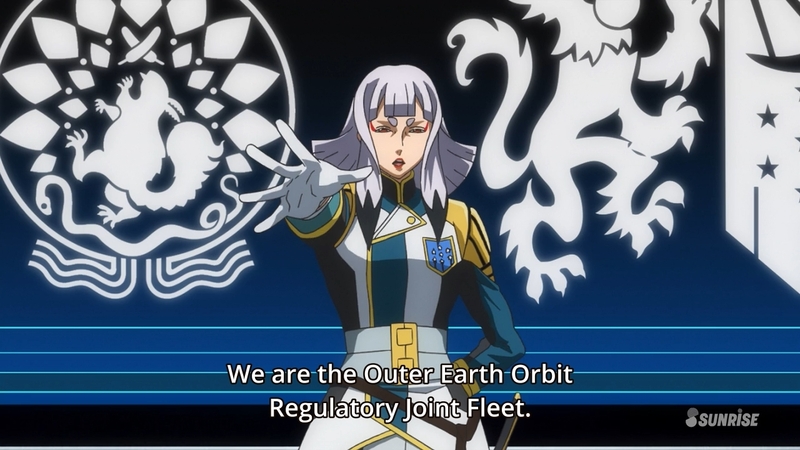 If Carta is strong-arming through the Oceanian Federation protection, I’m guessing it means that the “retreat from Mars” option is no longer available for Tekkadan. 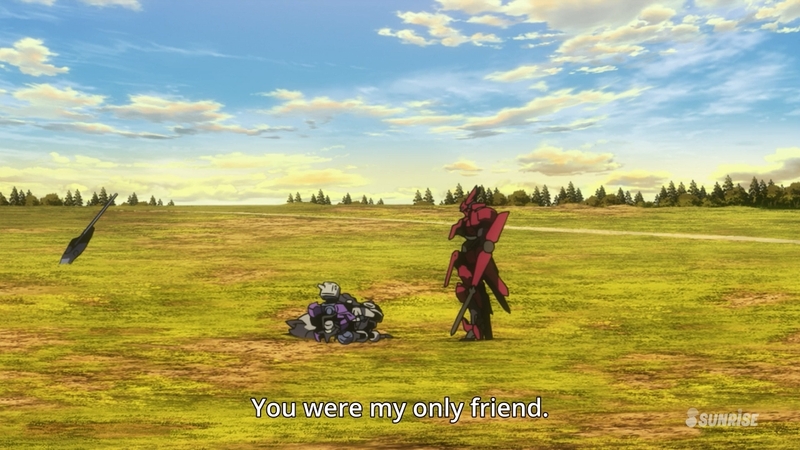 What was even the point of the episode if it ends up like this? 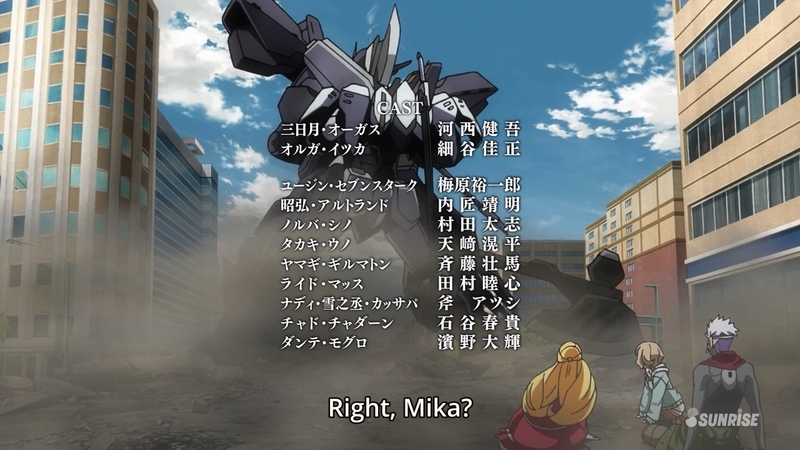 Anyway, next week’s episode looks to be the beginning of the Earth battles. 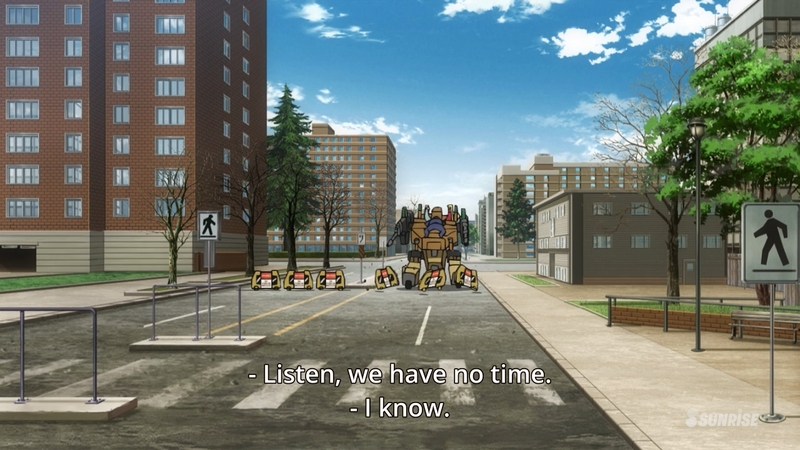 It also looks like the tanks from the very beginning of the series will be making a comeback. Should be a lot of fun! 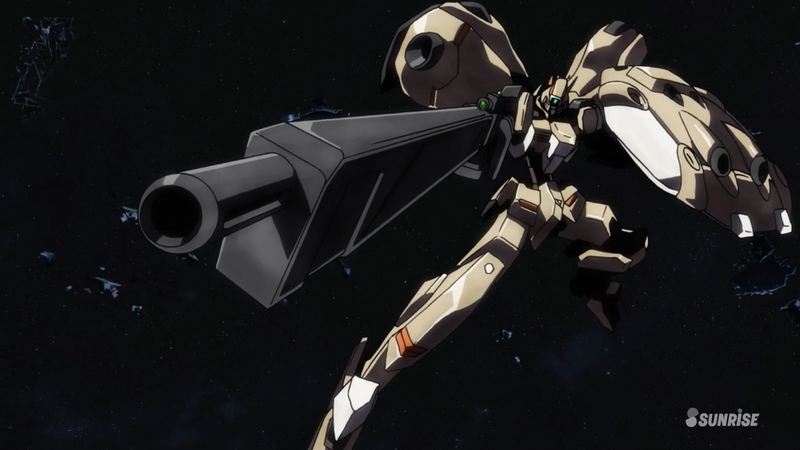 I’m looking forward to seeing the new Earth-combat enhancements for the Barbatos. Is this entire opening scene supposed to be forced romantic progression? Because I think it is! 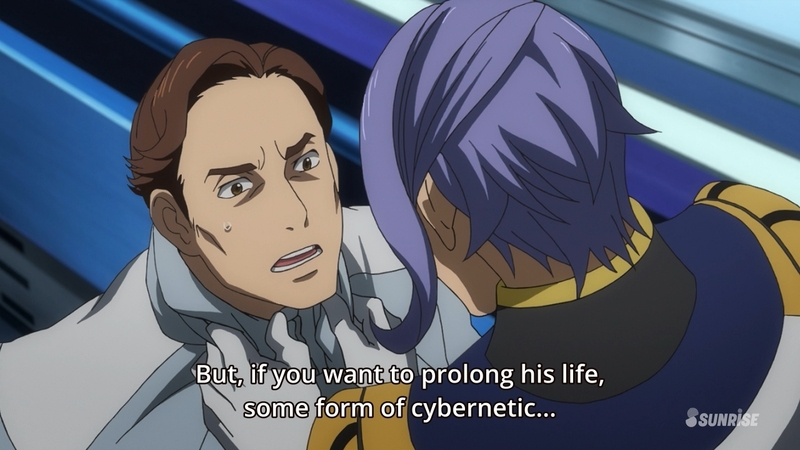 Orga seems really upset that McGillis gave him the fake name “Montag”. 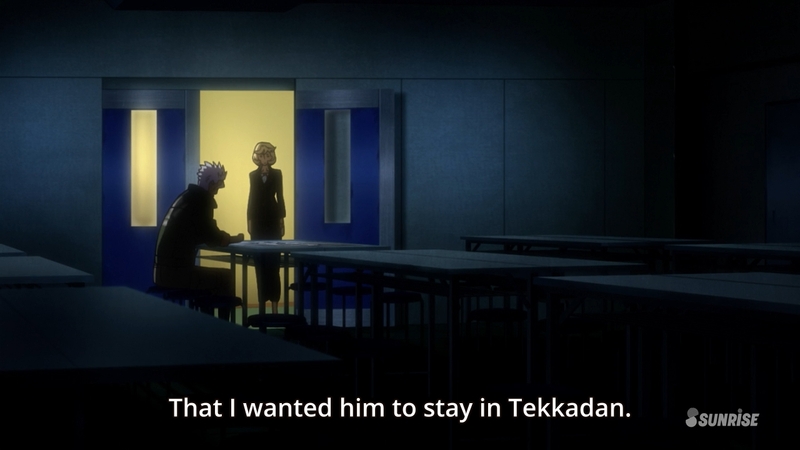 If Mikazuki can so easily identify him, is it really that important to have his name? 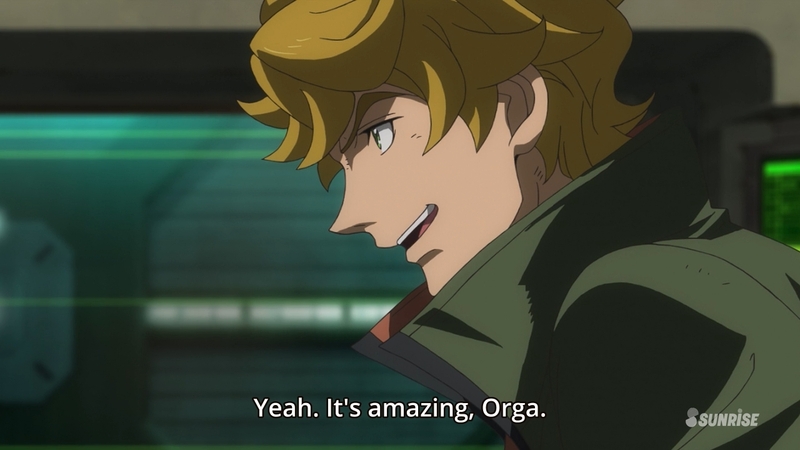 Or was Orga just trying to trick him into saying it? 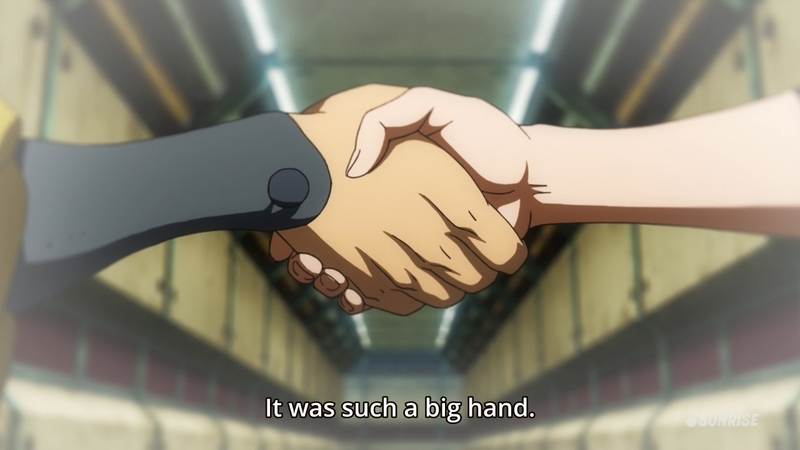 “My male love partner has such big hands” cliche. Seriously…I’m guess tired of this passing for “romance”. 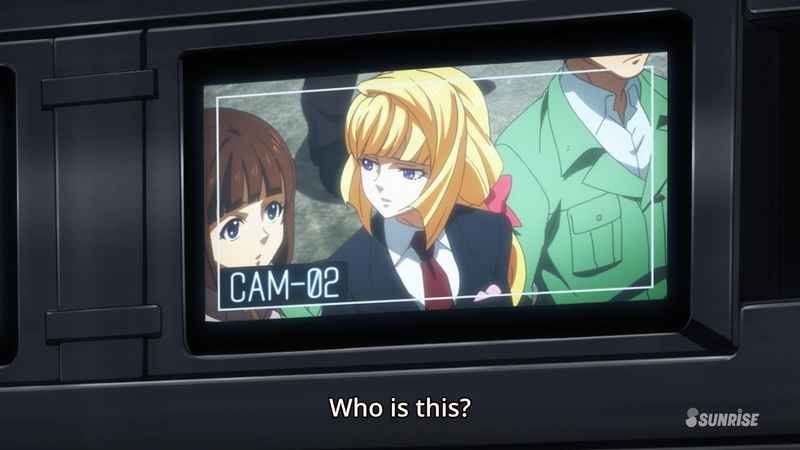 Whoa…that screen disappeared before she even finished the hand gesture. This futuristic technology is pretty good! She’s in a flashback? Yeah, she’s definitely important to the story. 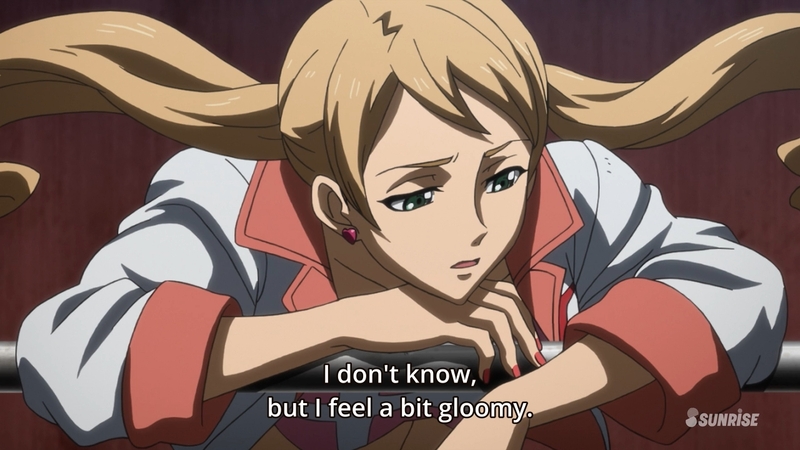 Apparently, she’s the childhood friend, which means she probably dies to motivate McGillis, right? 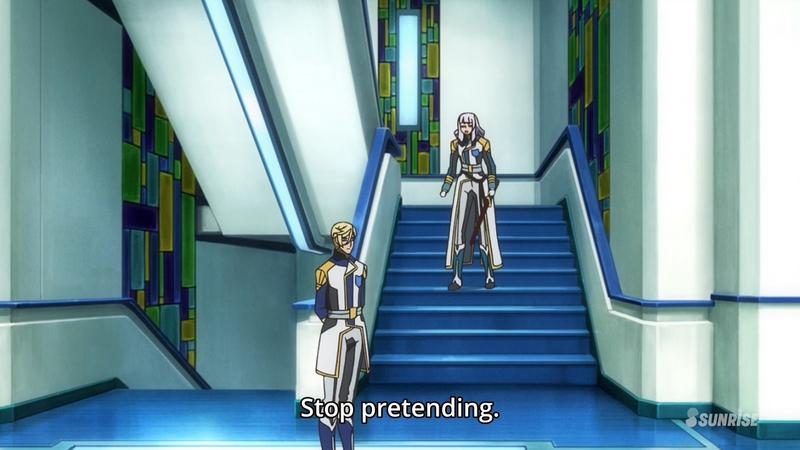 This entire montage with McGillis talking in the background sounds like the preparation for a final battle. 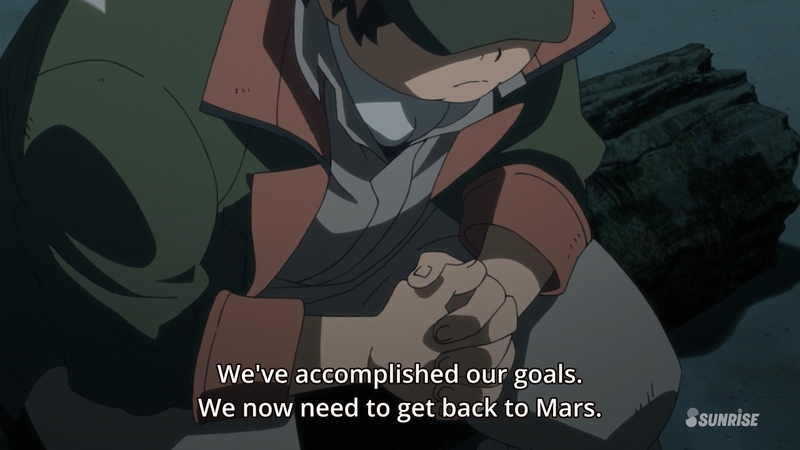 I guess getting on Earth really is the final goal of this series. 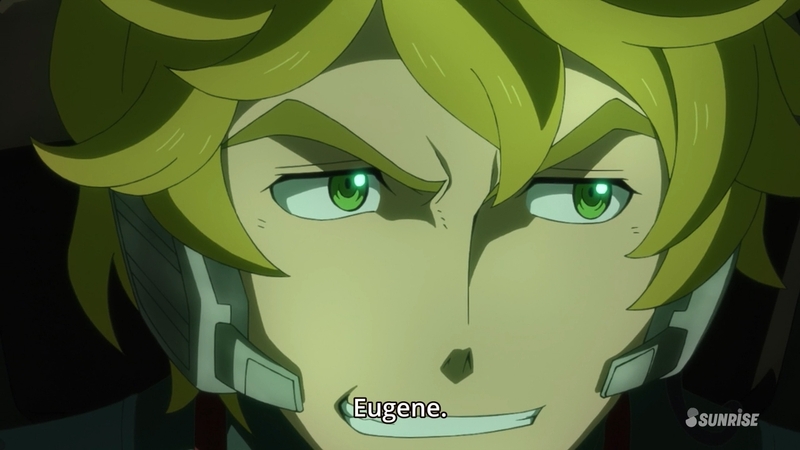 Eugene’s time to shine! Also a death flag, but who knows? 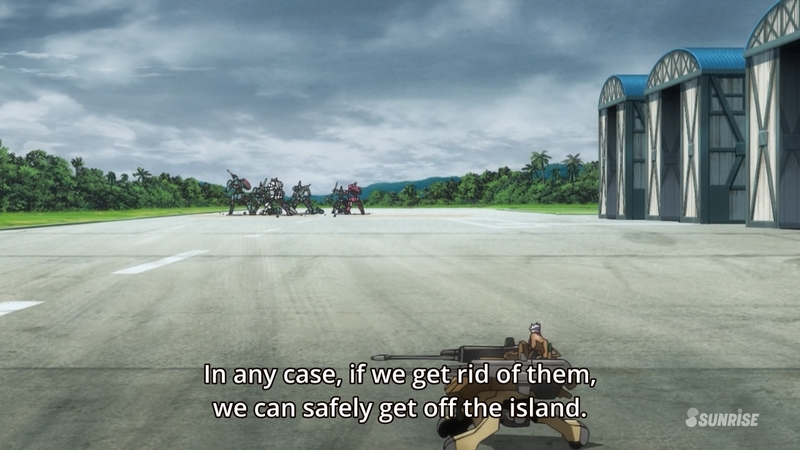 So the two ships split up and the guy manning the weapons asks which one to shoot. This is not an appropriate response. 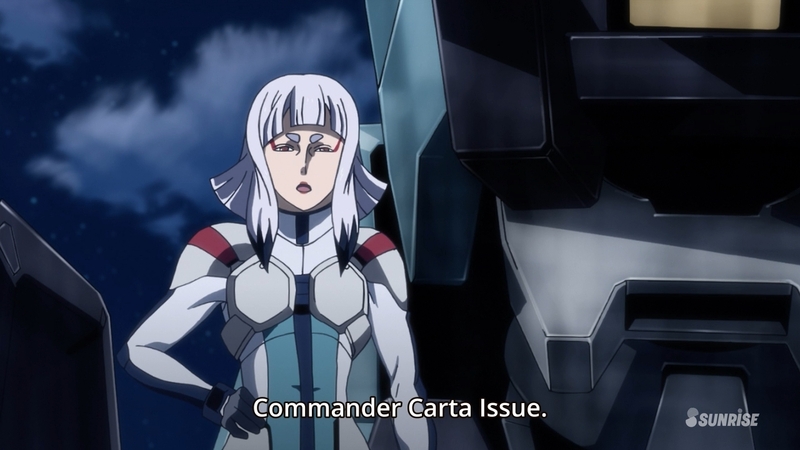 How did Carta become a captain? 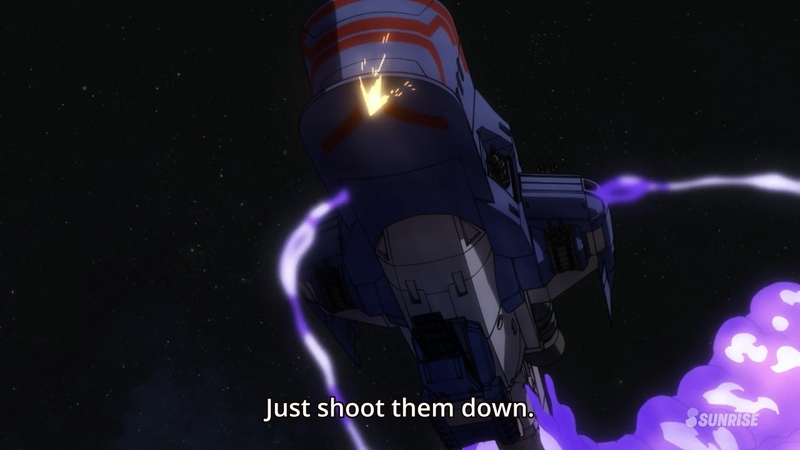 And apparently, this order gets interpreted as “shoot the ship that was in front”…which makes no sense because that ship was being used as a shield and was obviously meant to be shot down. Why would anyone do this? 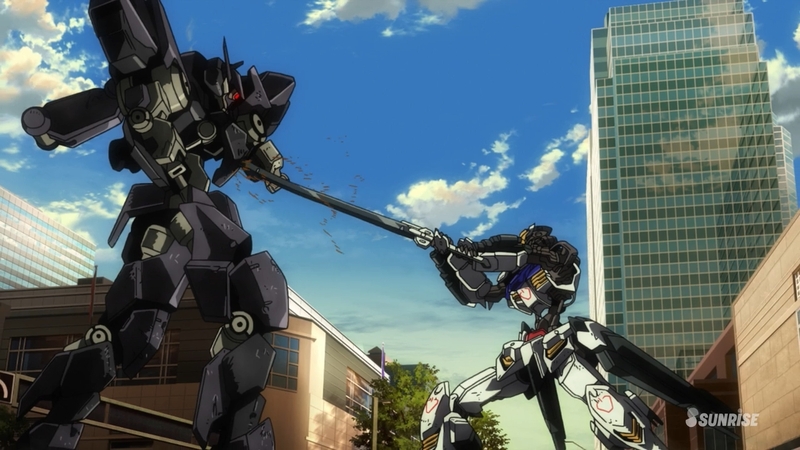 Wait…Mikazuki has the mace back? There was a scene in the last space battle specifically devoted to showing us that the mace had flown off. What was the point of that? 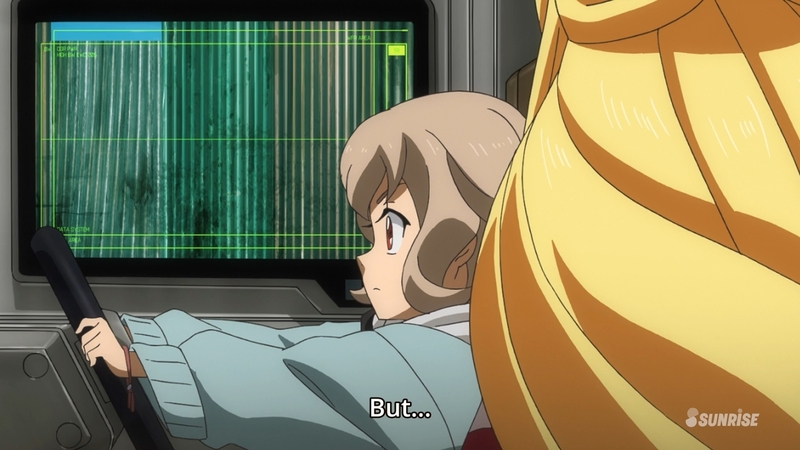 It was nice that these girls get a final cameo before splitting from Tekkadan, but this was no mere cameo. 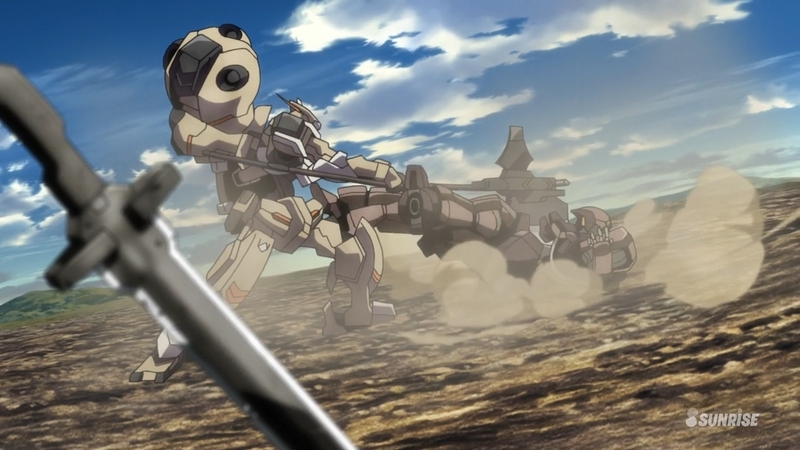 Holy crap, this scene was awesome with how they passed weapons to each other. That display of synergy really gave their entrance impact. Okay, let’s go over the chain of events. 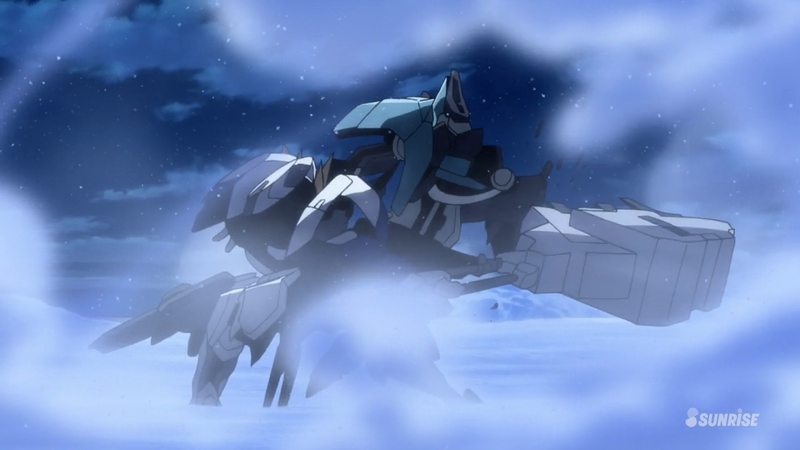 Ein gets a reading from his mobile suit from Gali Gali’s battle against Mikazuki, so he abandons his fight and rushes over just in time to take the lance attack for Gali Gali. 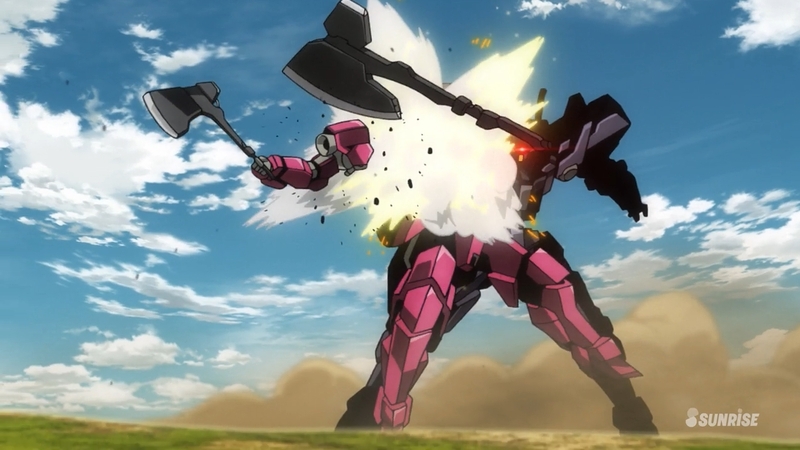 There’s no way his suit picked up the throwing of the lance, so what exactly did he detect? 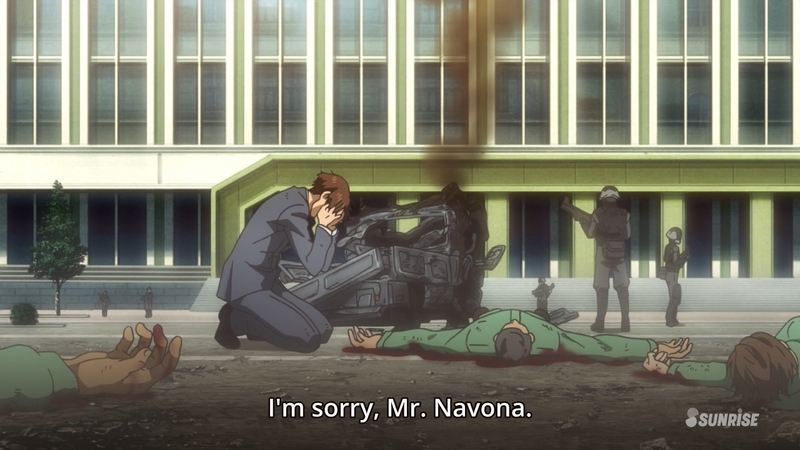 Also, Ein’s suit didn’t explode, so I’m guessing he’s still alive. 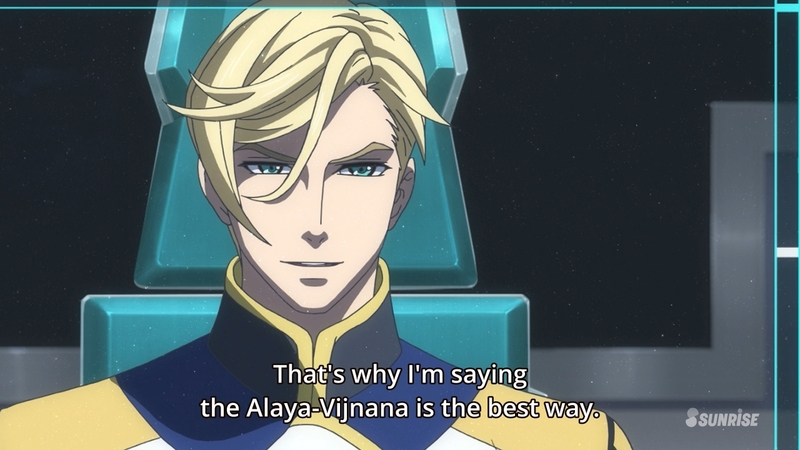 Given that he’ll likely need advanced surgical attention to recover, I’m also assuming he’ll use this opportunity to get the Alaya-Vijnana system installed as he mentioned to Gali Gali last week. 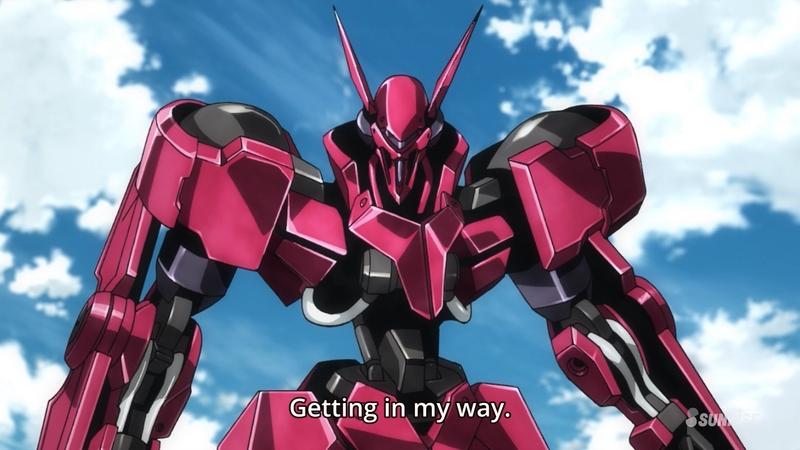 Iconic Char character gets the iconic Char red mobile suit. I’m not complaining…this suit looks awesome. 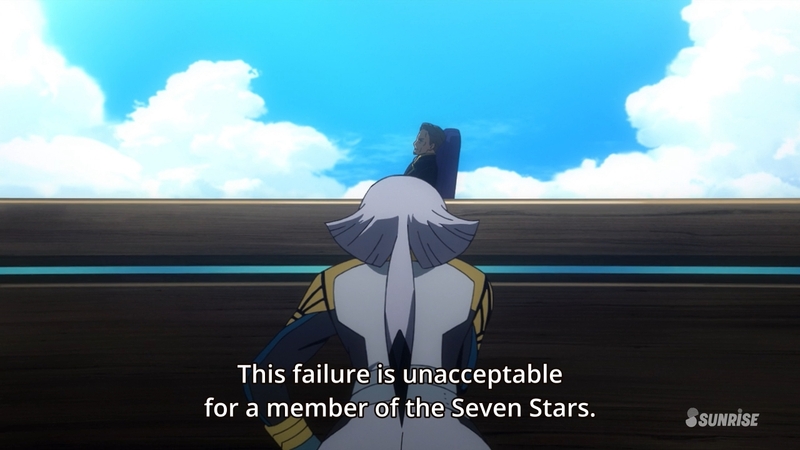 It really looked like this guy’s was just left here to kill someone in the atmosphere re-entry scene, but I guess he was only meant to split Mikazuki from the rest of the group. My bad…I was being too morbid. 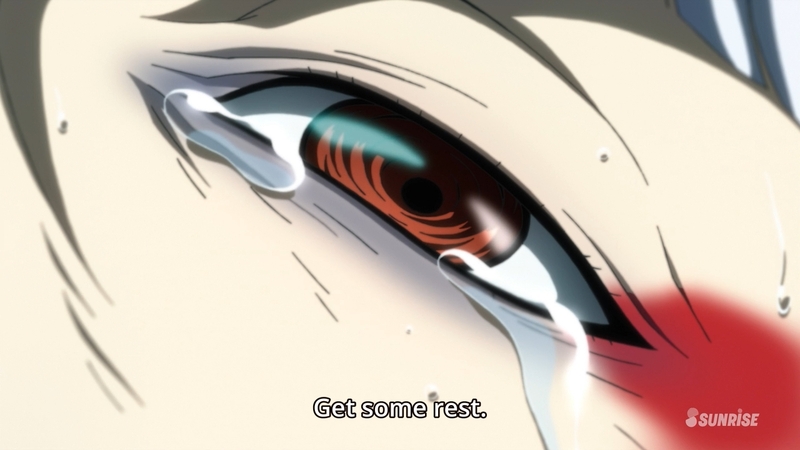 We knew he was going to survive because he’s the main character, but this scene was pretty awesome. And so, landing on Earth means the end of the space battles…too bad. 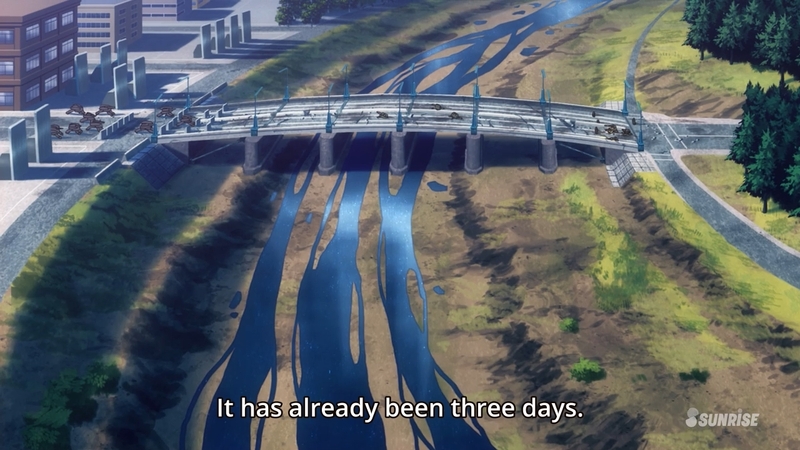 If the rest of the season is supposed to take place on Earth, what’s the finale supposed to look like? 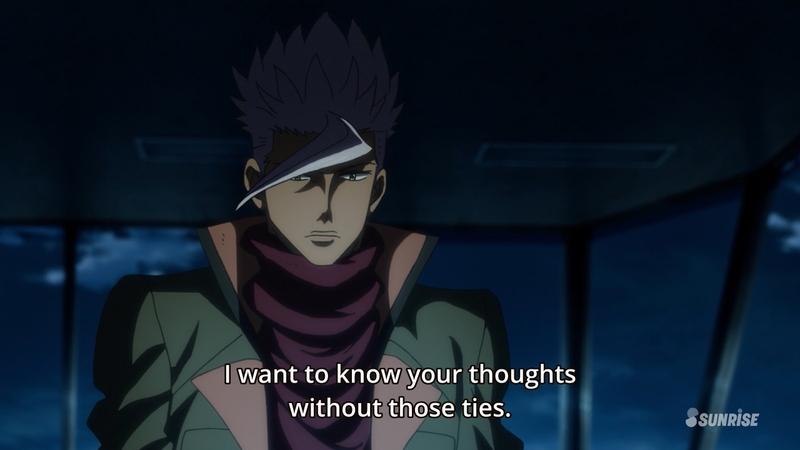 Gundam Iron-Blooded Orphans Episode 18: Words! 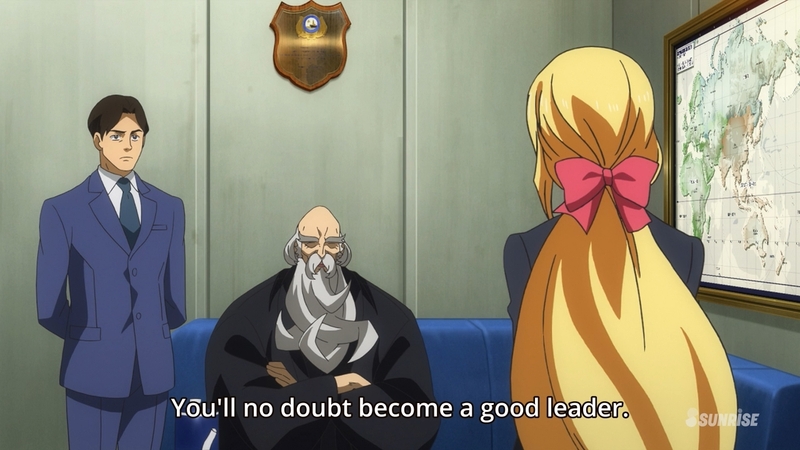 Continuing from where we left off last time, here’s Kudelia’s speech! It’s interesting that she just flat-out tells everyone what happened at the protest…I wouldn’t expect people to believe her. The song that’s playing right now sounds really cool and folksy, but I wish it would have swelled up into something more epic. The big reveal? Negotiations with the mask! Oh hey…he’s a half-blood. 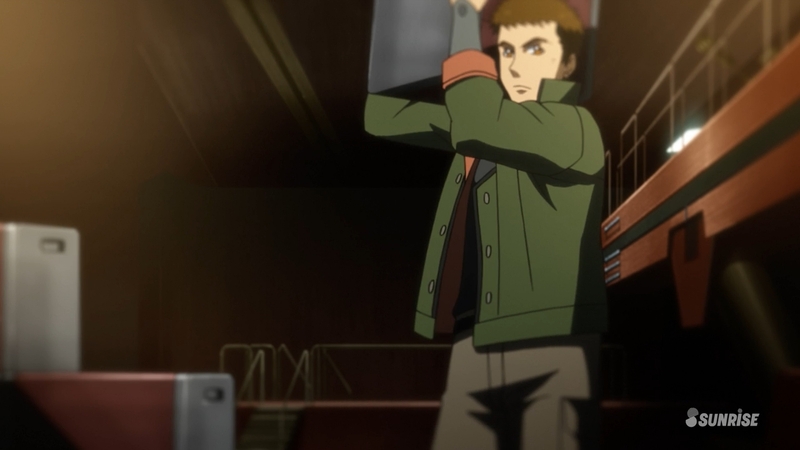 Well, at least we finally know why Ein is so obsessed with avenging Crank. 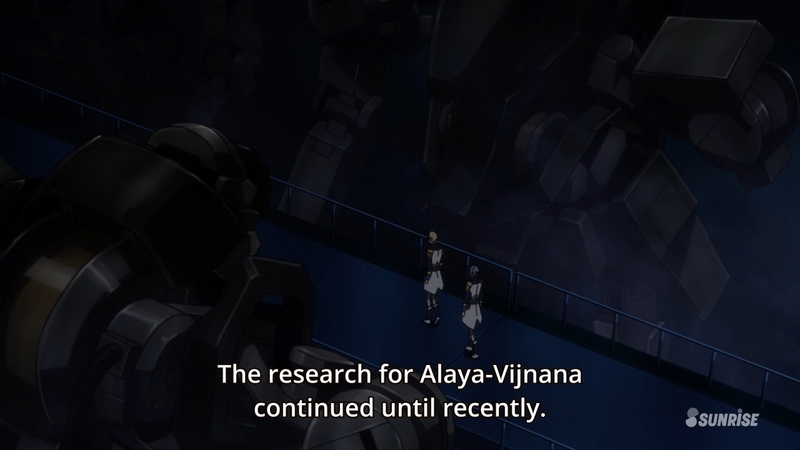 I’d also be cool with Ein getting the Alaya-Vijnana system installed. He needs a better gimmick than “I will avenge Crank” in every battle. 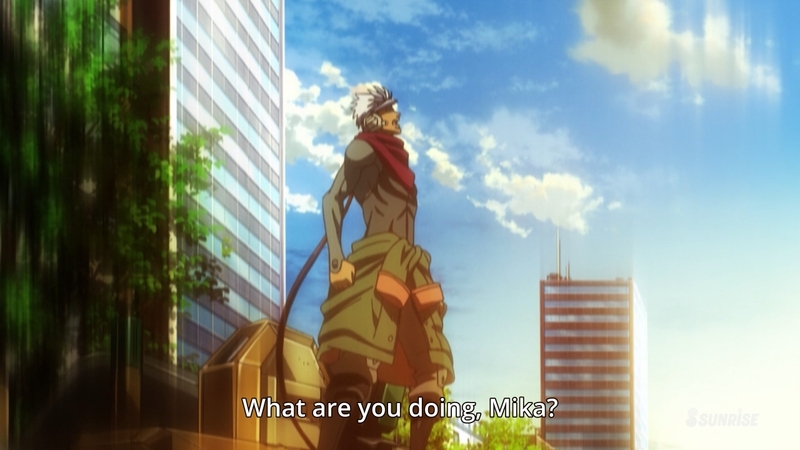 Haha…Mika saw through McGillis in an instant. He didn’t even hear his voice, so it was purely by appearance. Is that even possible?? 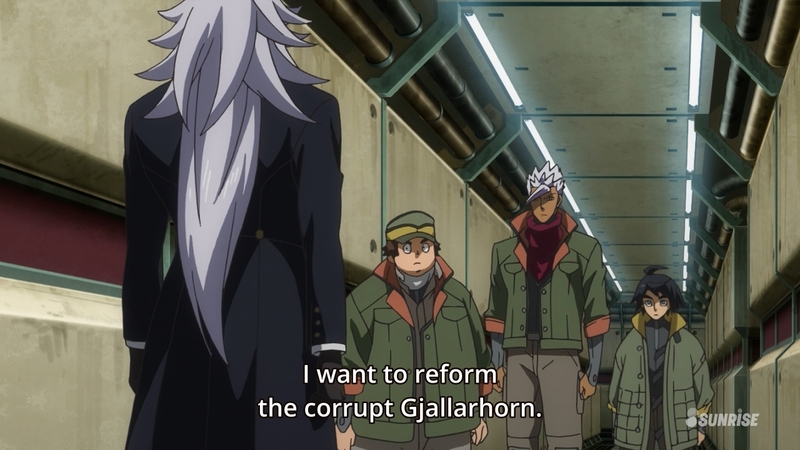 We must change Gjallarhorn…from within! 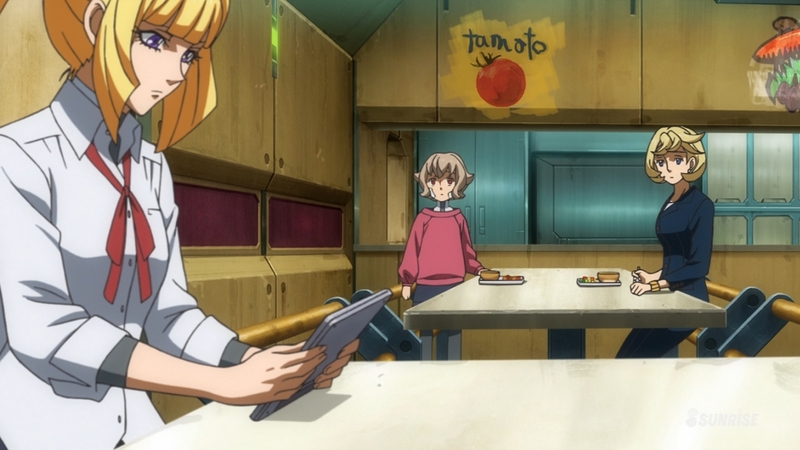 I know these kids are being taught how to write from Kudelia, but…”tamoto”? No one thought it would be a good idea to fix that? 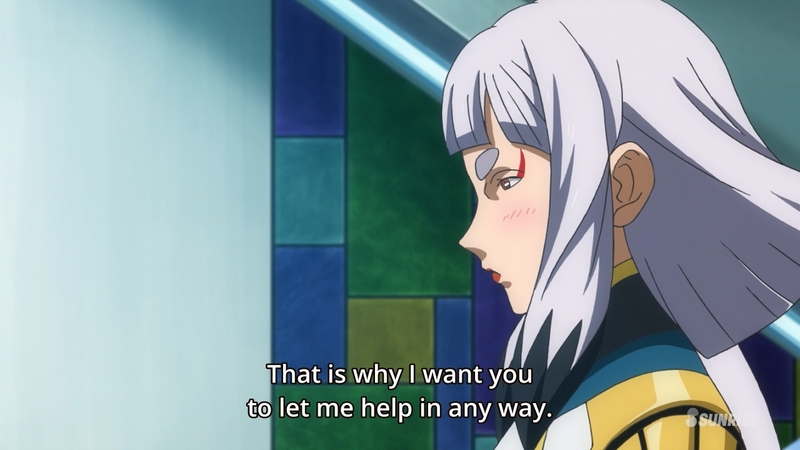 …sigh…they’re really trying to make people hate this woman from the first impression, huh? 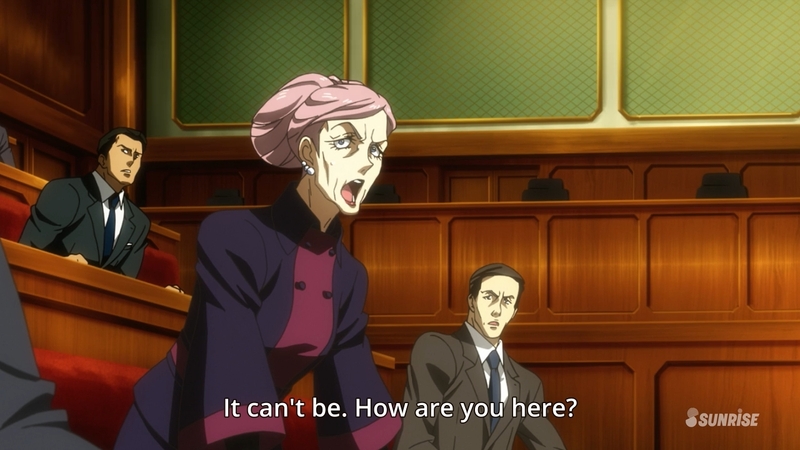 This scene is interesting because of how they seem to emphasize the fact that there’s a hidden truth. Is it just a general statement about people? 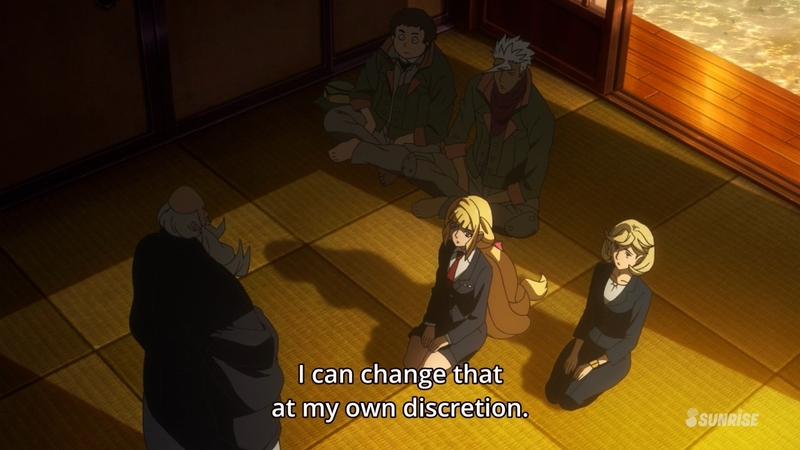 Or is there some hidden side to Kudelia’s background that we don’t know yet? Seriously? 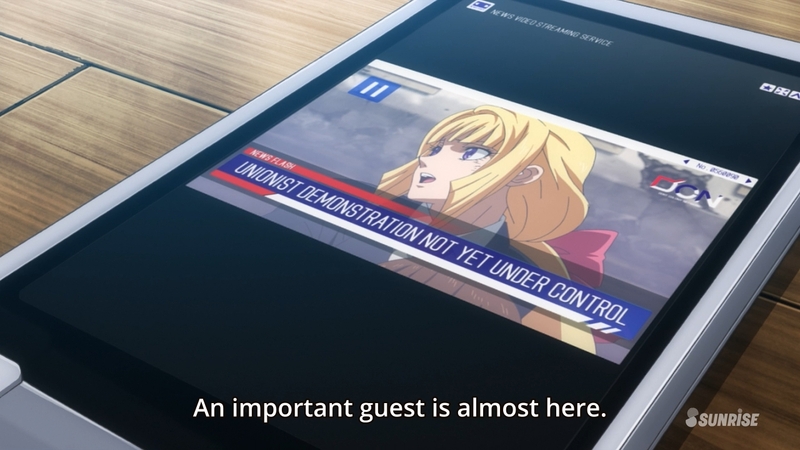 That’s like the third tablet they’ve shown in this episode with a widescreen video that isn’t rotated. Why do these people insist on watch such a low-quality shot? Just rotate the tablet and it will fill the screen! A new team is formed! 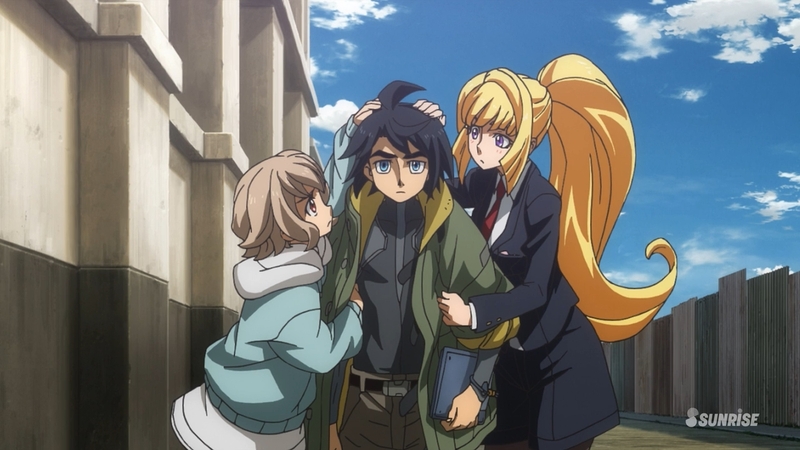 Harem Master Mikazuki strikes again! More space battles next week! 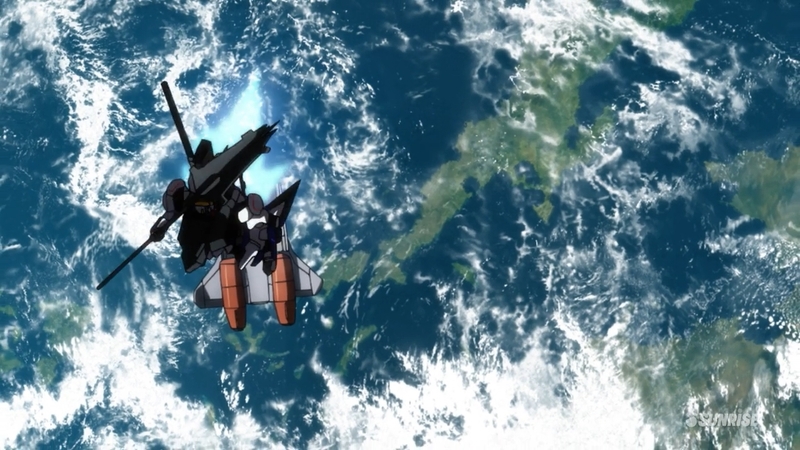 It looks like there will be an Earth atmosphere entry scene for the Barbatos, so that should be fun…it’s a very easy place to kill a character. 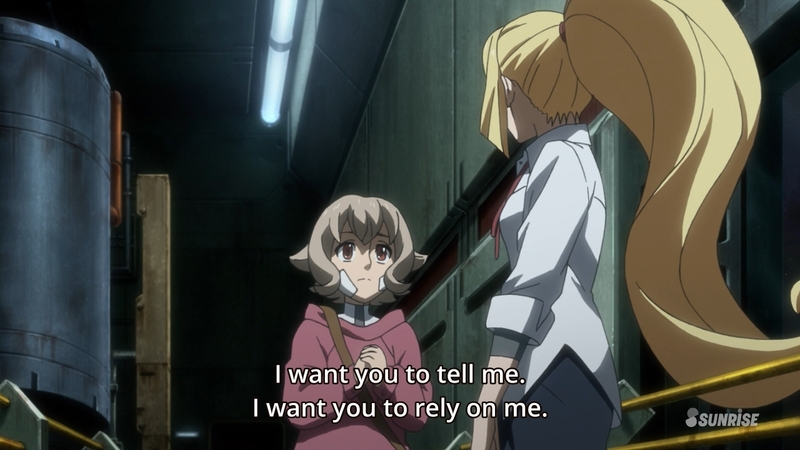 Author marthaurionPosted on February 7, 2016 Categories Gundam Iron-Blooded OrphansTags barbatos, gundamLeave a comment on Gundam Iron-Blooded Orphans Episode 18: Words! 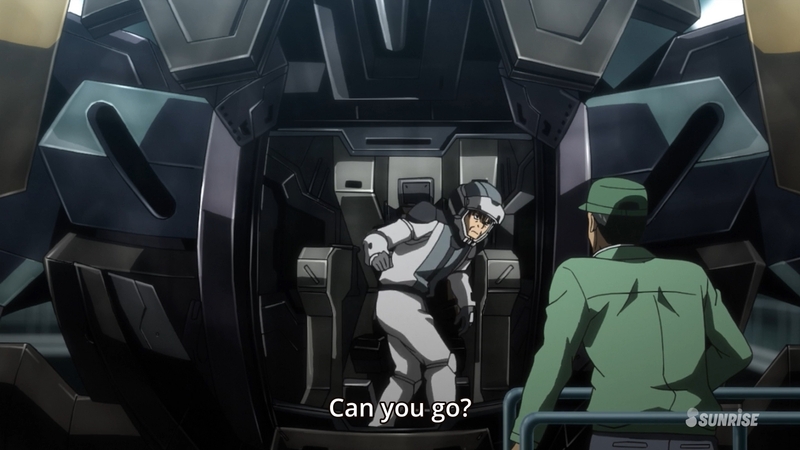 Gundam Iron-Blooded Orphans Episode 17: New mobile suits are here! Finally! 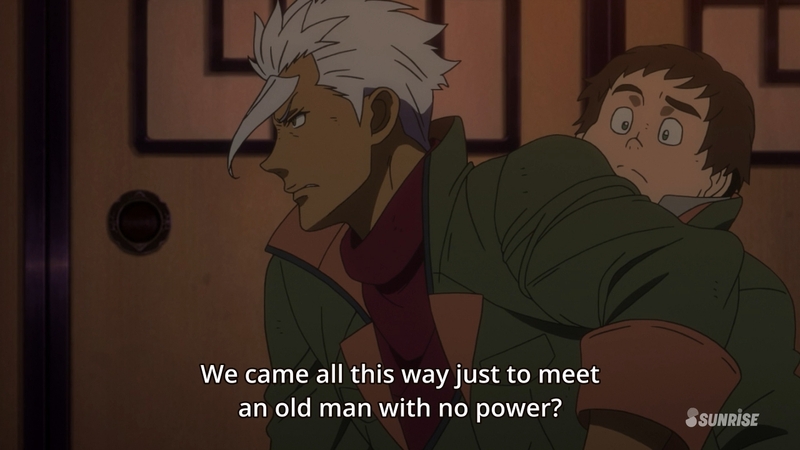 While I’m fine with the main antagonists disagreeing with the methods of their corrupt government, I’m getting a very strong “change it from within” vibe from this statement. Hahahaha that lady’s expression! It looks like she’s shifting her gaze suspiciously. Is she finally going to be useful? 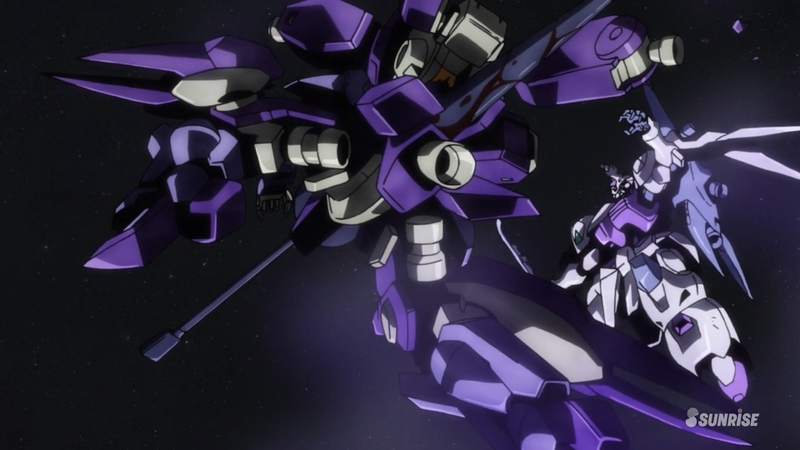 Time for full Lacus mode? This wouldn’t be a political show if the government didn’t try to silence the media. 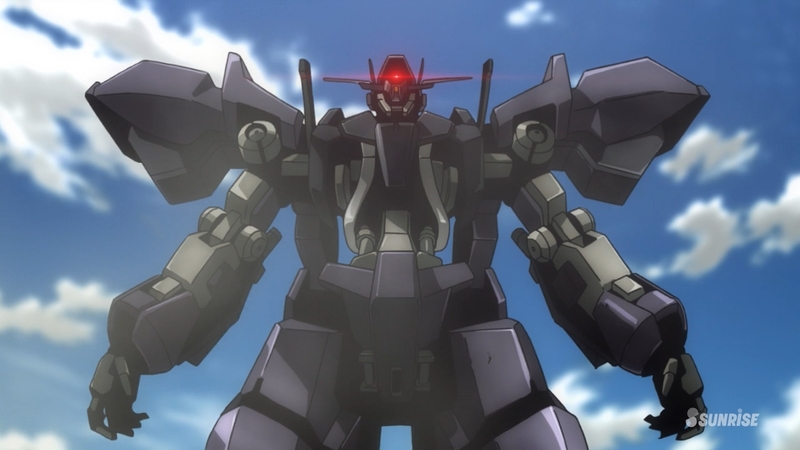 Finally time for Akihiro’s first battle with the upgrade Gusion? I’m totally hyped to watch this. 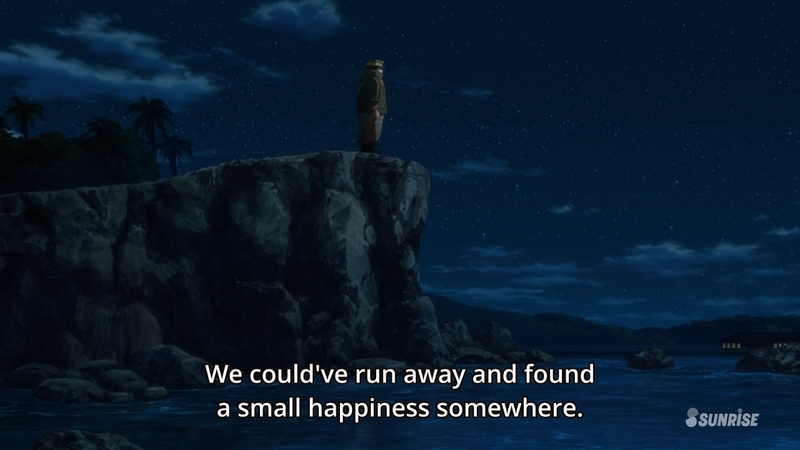 This line is interesting because of how random it seems. 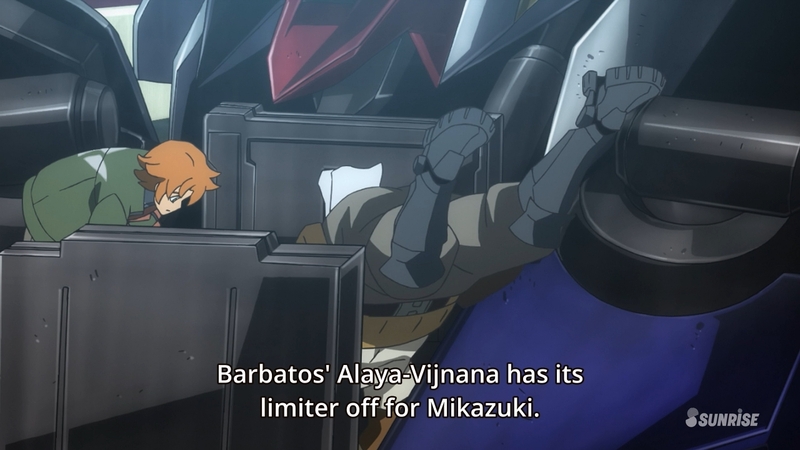 We’ve seen Mikazuki pilot the Barbatos for the entire series and we’re just now finding out that he’s been doing it without any limit of the data that gets transmitted through the system? Has he been keeping this a secret? 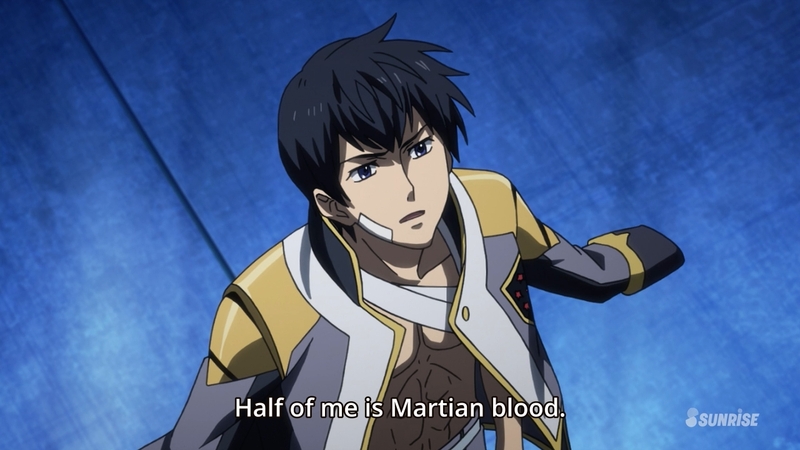 Also, I was totally expecting Dante to die, but this random piece of information probably saved his life. IT’S BACK! Man, I’ve missed this. 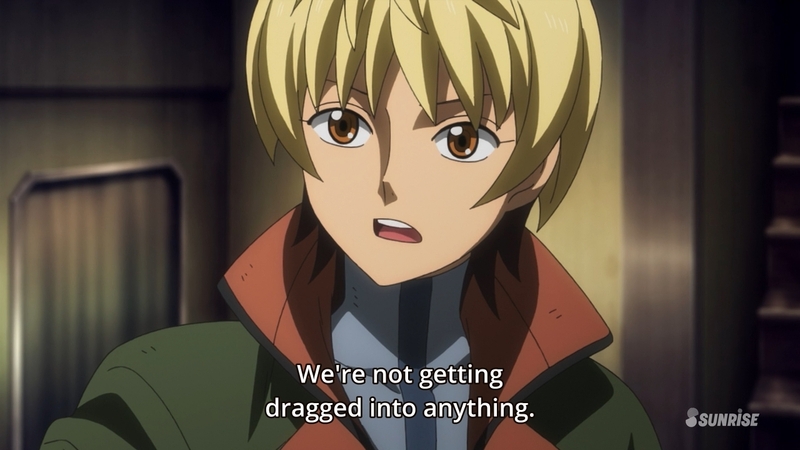 Also, it may feel strange to backpedal, but what was up with Mikazuki’s line about “feeling frustrated”? 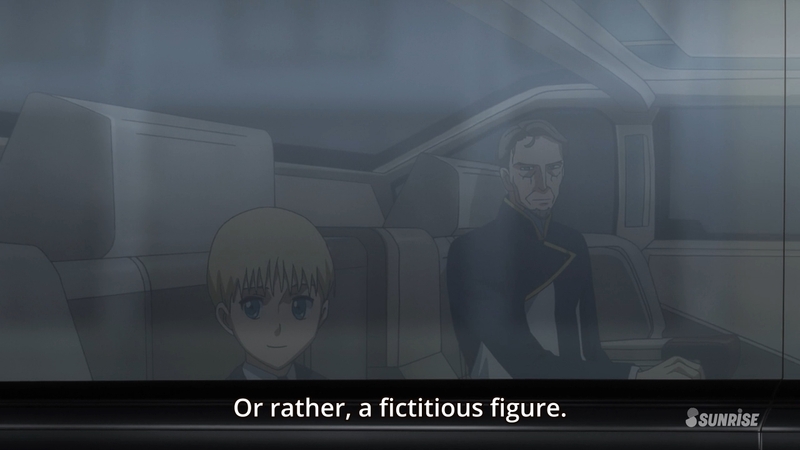 Was he acknowledging Kudelia’s newfound passion? 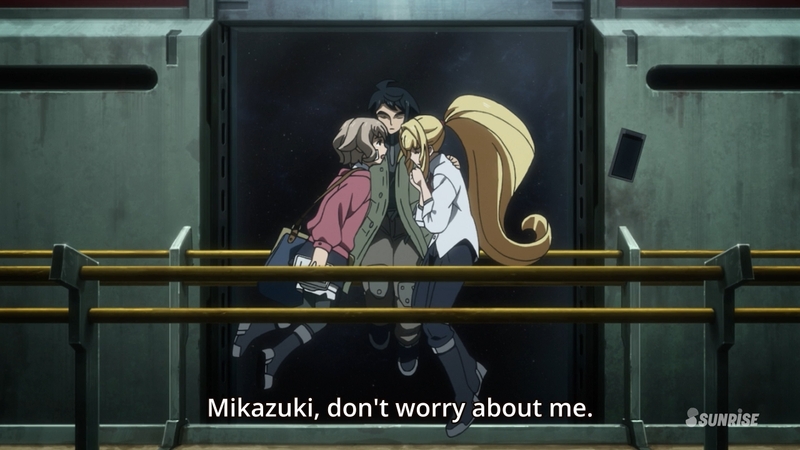 Whoa whoa Mikazuki…you’re letting your emotions show! Yup, I guess so. If these things are so powerful, why do they get tossed away as antiques? I don’t understand. Oh yeah…I forgot about this machine. 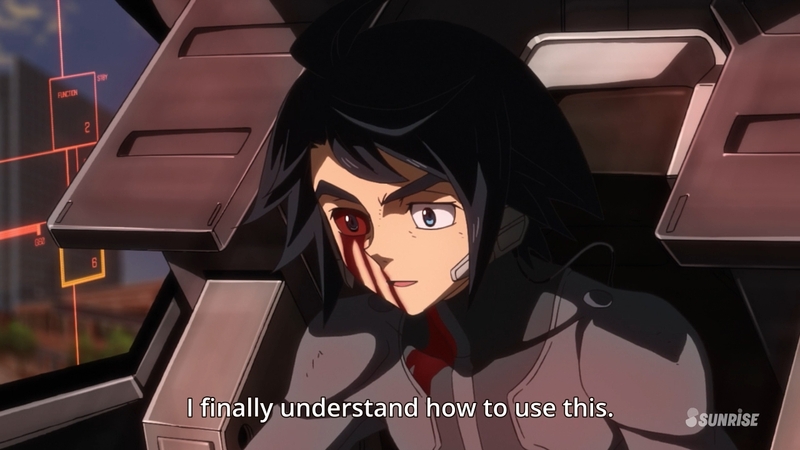 I guess they just gave it to someone else now that Akihiro can’t use it anymore. 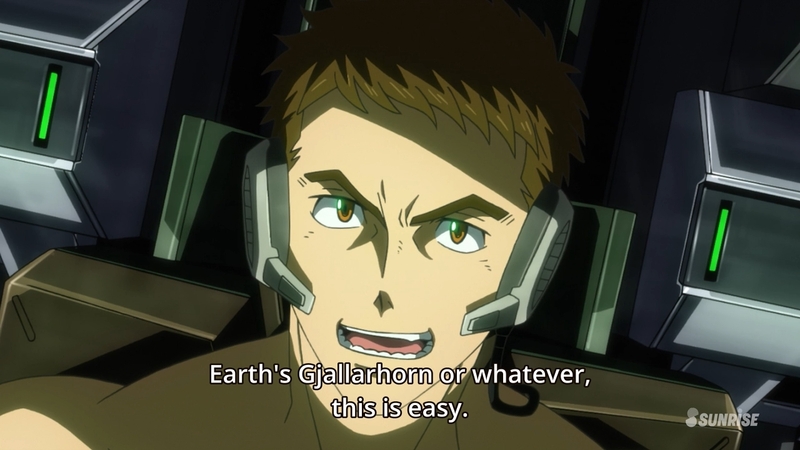 High-level battlefield taunting going on here…also, I guess we’re calling this guy Gali Gali from now on. 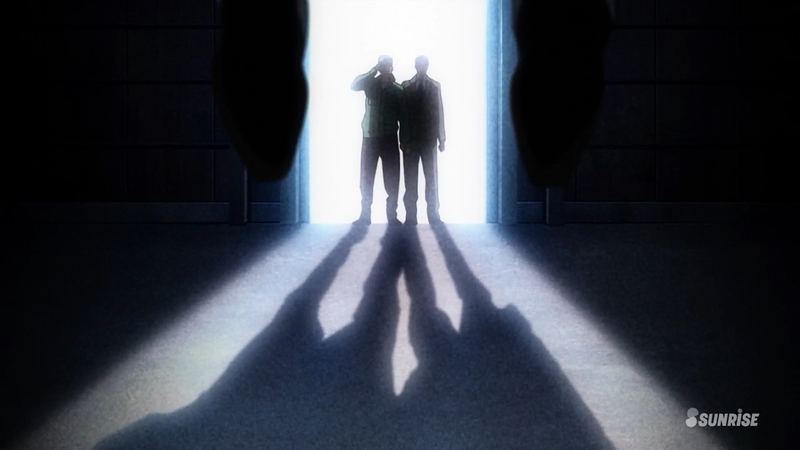 Yes, I know this is a cliche pose, but holy crap this scene is awesome. I really like the new Gusion. 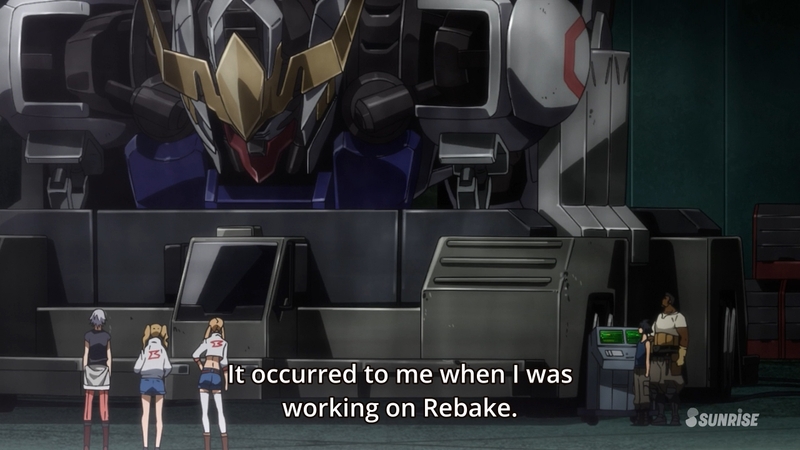 Also, “Rebake”? Seriously? 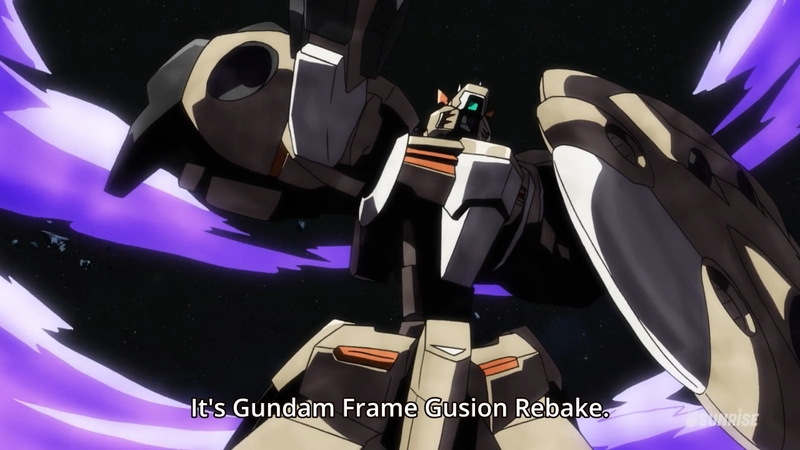 I really hope these guys meant to call it the “Gusion Remake”…because that actually would make sense. What is this? 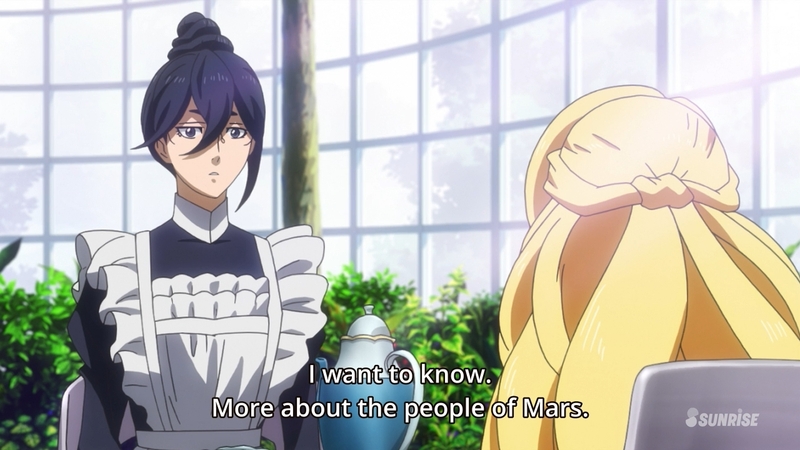 Space Bakery? 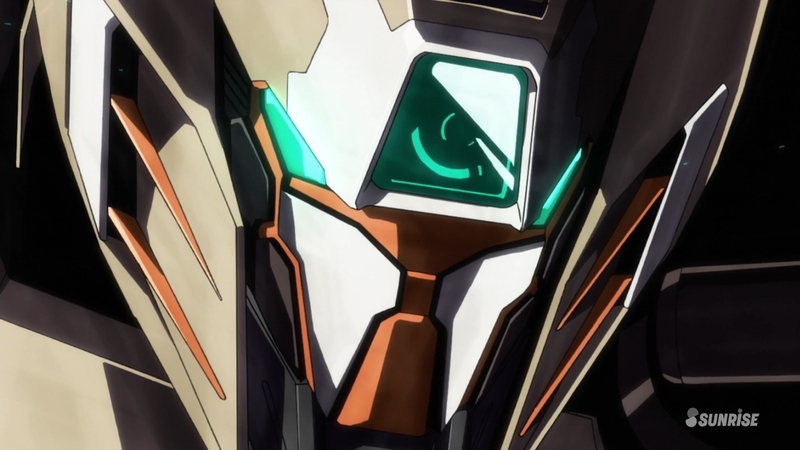 The completion of this attack requires the opening of my Gundam’s face. 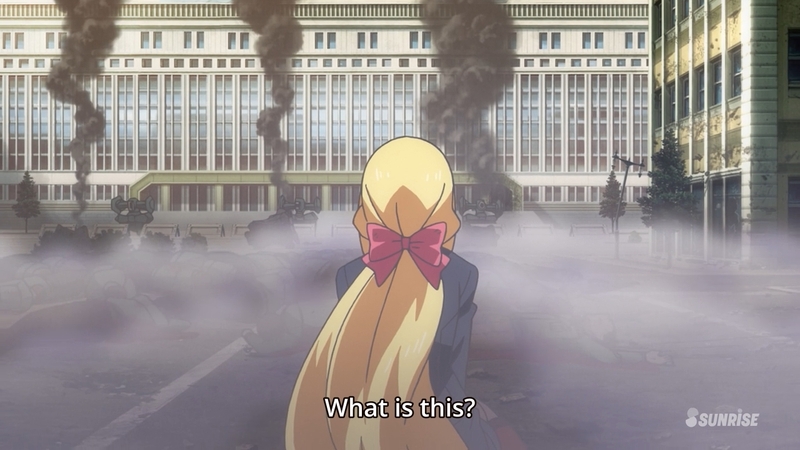 Don’t get me wrong…this entire scene looks super cool. But what exactly does opening the face up do while he’s in the middle of an attack? 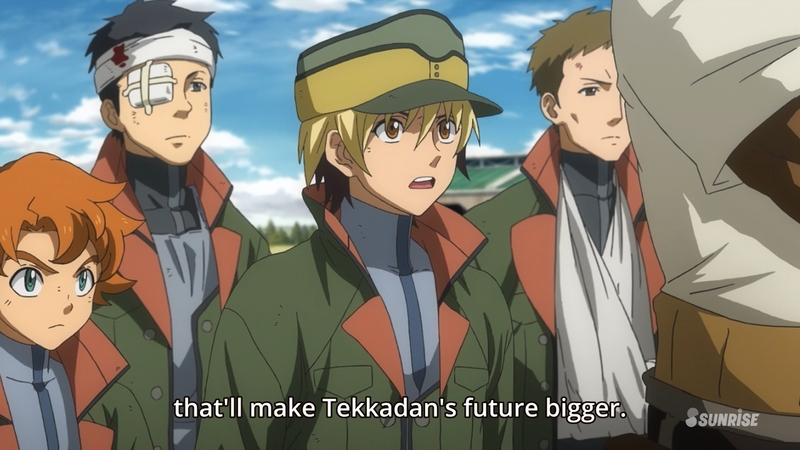 This news broadcast will probably save everyone in Tekkadan, but we don’t get to see how until next week! 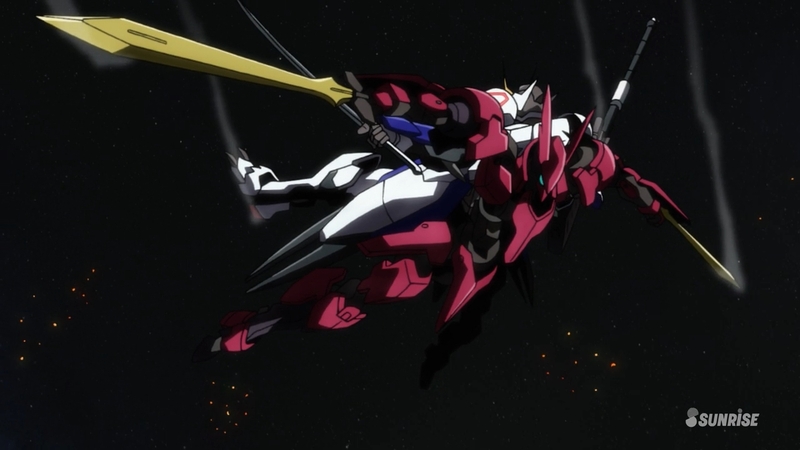 There’s a scene that I didn’t screenshot in this episode that I wanted to ask about…didn’t the Barbatos mace fly away in the battle against Gali Gali? Is it just gone forever now? 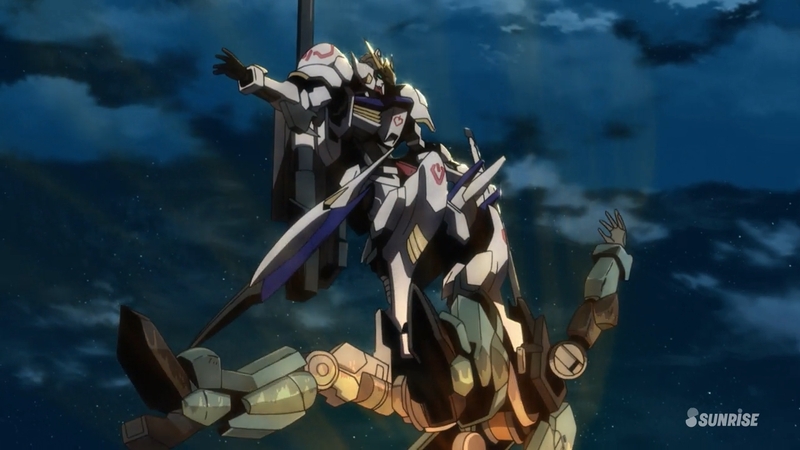 Or will it magically reappear the next time the Barbatos goes into battle? 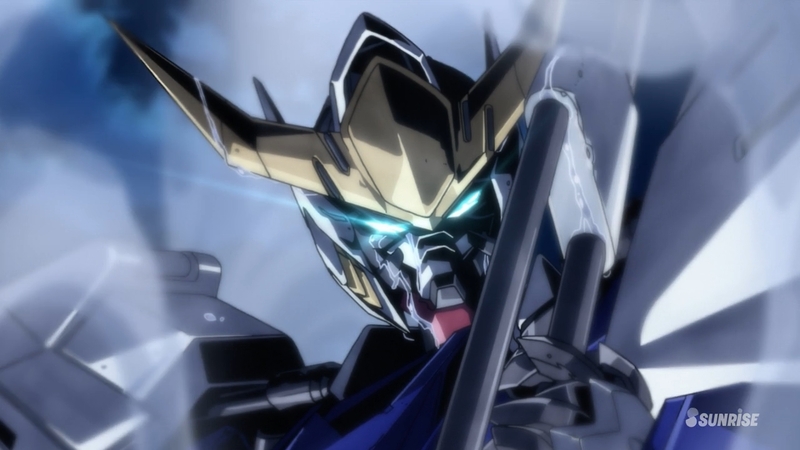 Author marthaurionPosted on January 31, 2016 Categories Gundam Iron-Blooded OrphansTags barbatos, gundamLeave a comment on Gundam Iron-Blooded Orphans Episode 17: New mobile suits are here! Finally! Starting off with a flashback, of course. 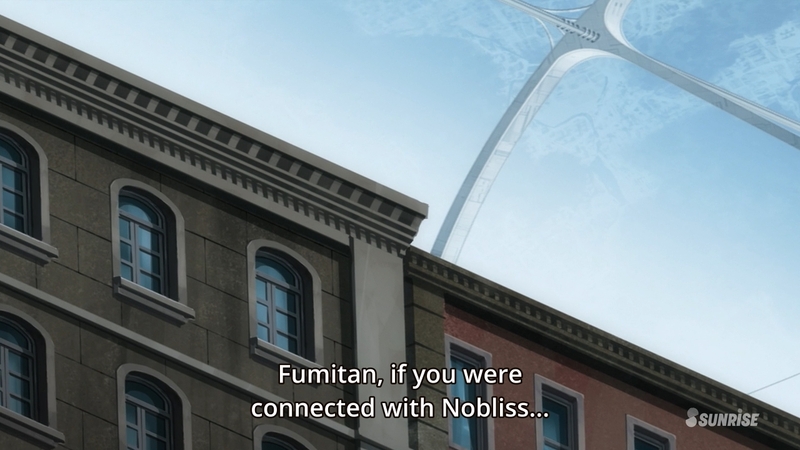 Huh…so that masked guy’s name really was Nobliss. 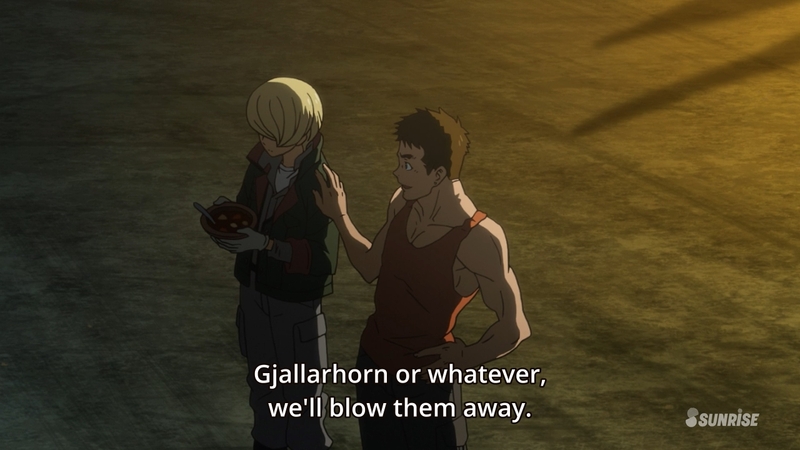 Interesting…Gjallarhorn is just letting this happen? 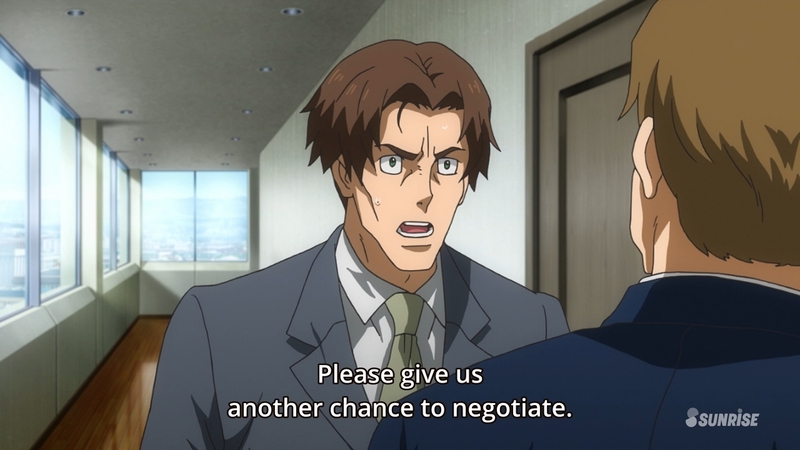 Are they just buying time for Fumitan to get Kudelia killed? 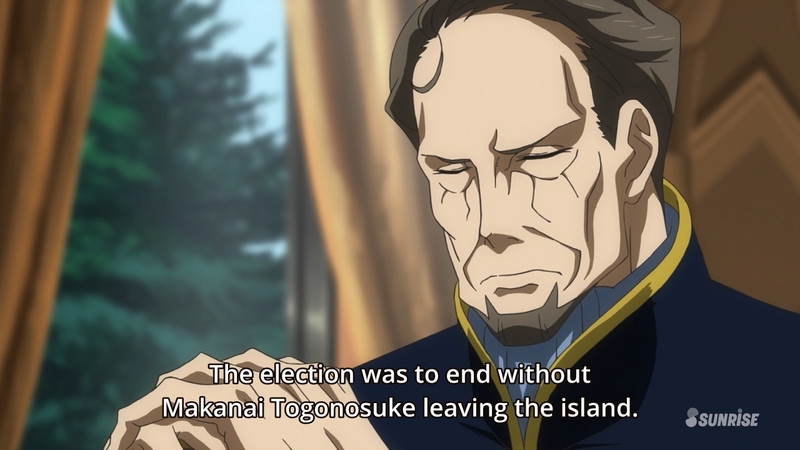 Wait…Savarin’s still relevant to this story? 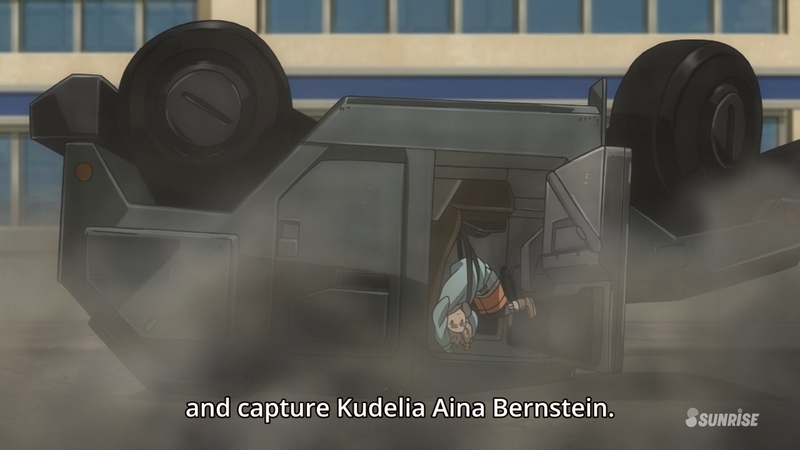 So does no one know who Kudelia is? Why was she ever in any danger? 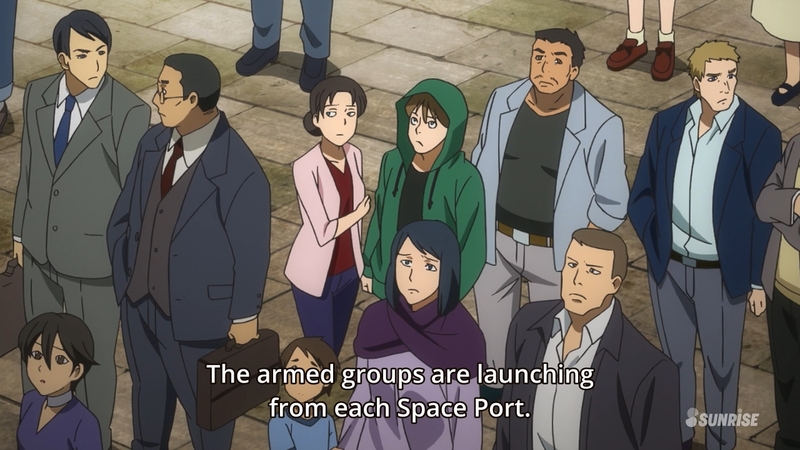 I guess this is convenient because getting on the news makes her more likely to be found by the Tekkadan group. 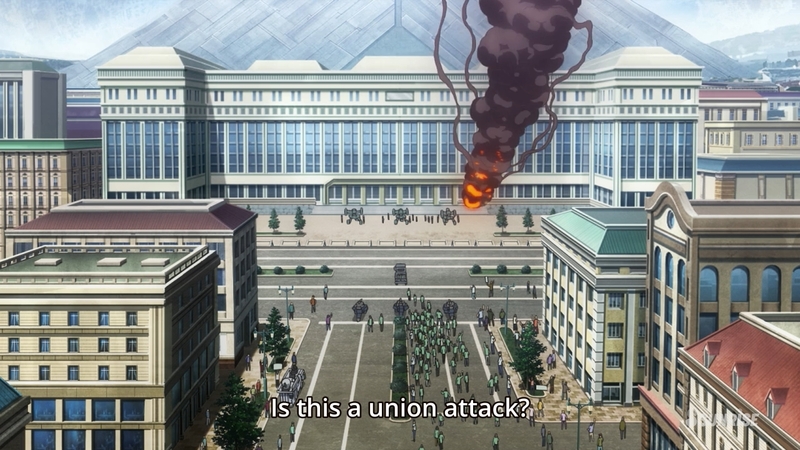 Oh boy…a fake explosion to make it look like the union members struck first. 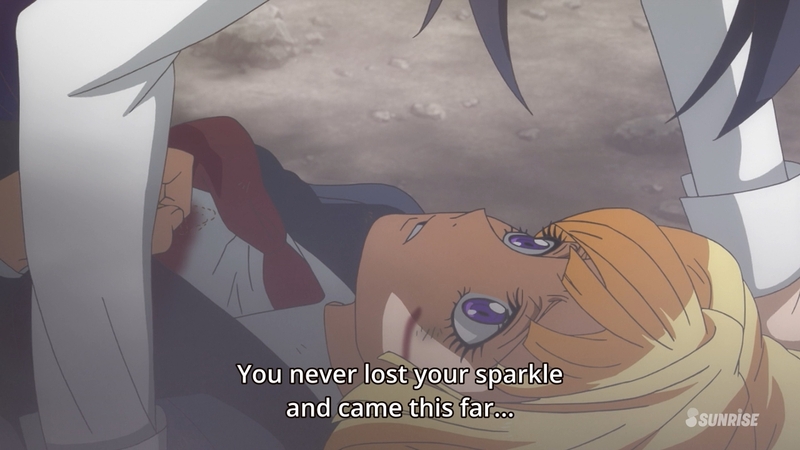 Wouldn’t it be ironic if this is actually the moment where Kudelia’s eyes lose their innocent sparkle? 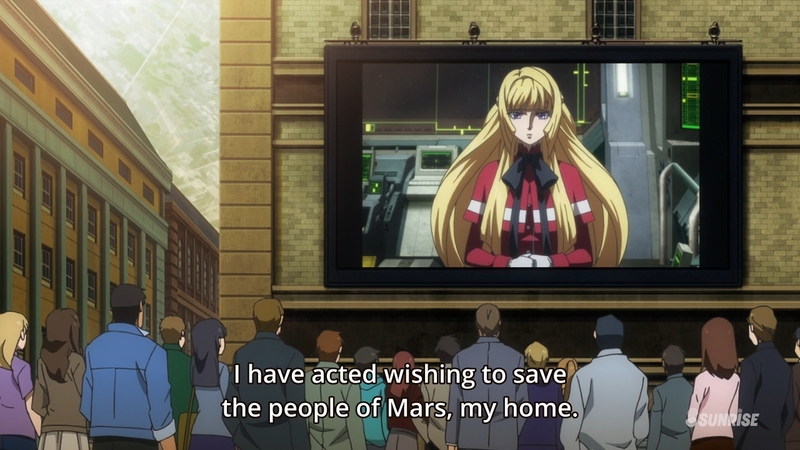 Nah…based on Fumitan’s words from the final flashback, it sounds like Kudelia will go on being a symbol of hope. She probably understands that she has to continue with her idealism. Yup…really starting to look like this guy is going to continue being relevant to the story. 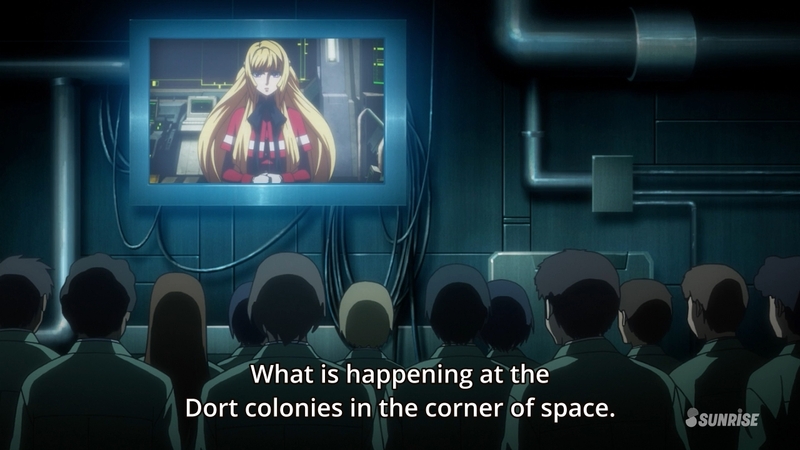 I had a hard time focusing on the episode this week with the worker revolt happening in the background. 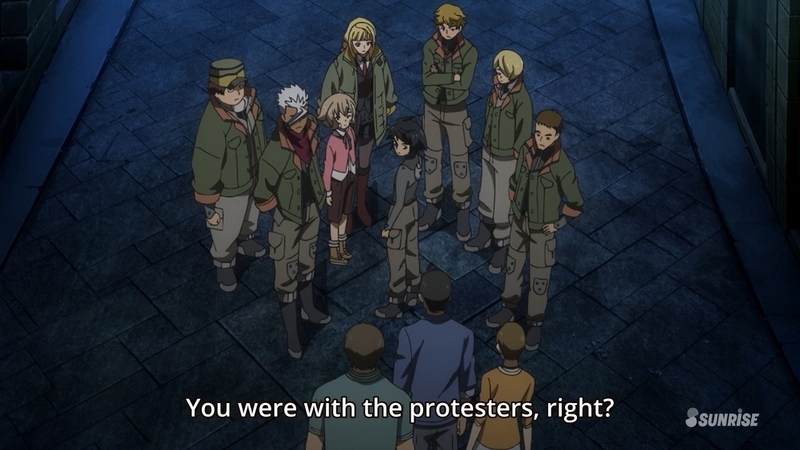 I just couldn’t make myself care for these workers…even when they were massacred. 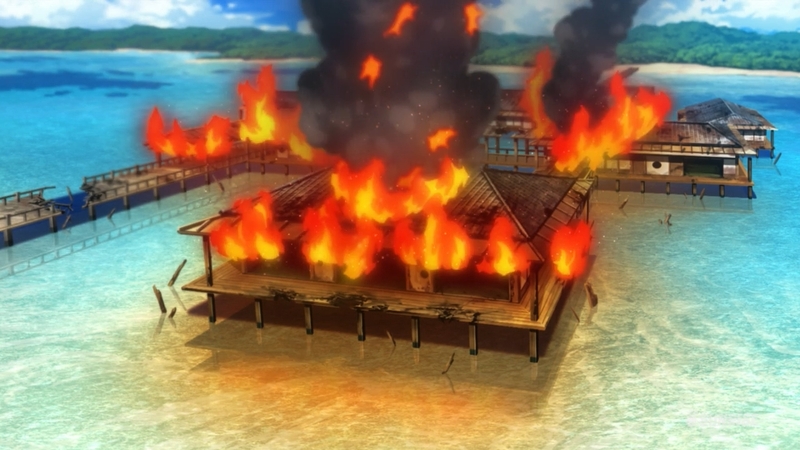 I’m really looking forward to next week’s episode. 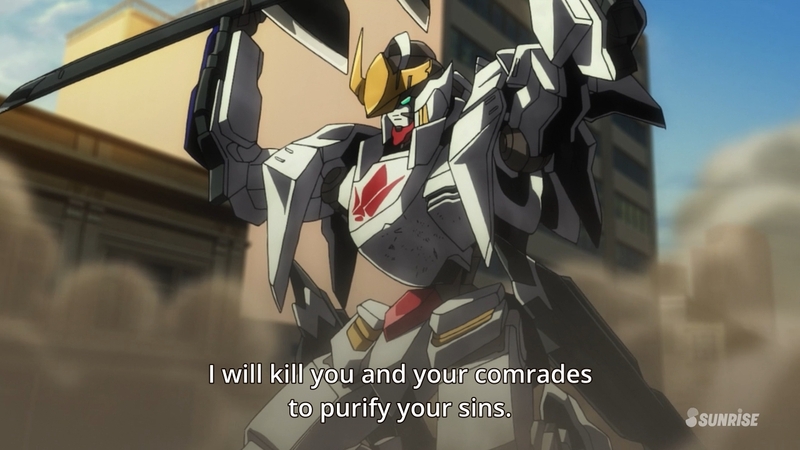 Finally the Barbatos is back in action! We’ve been going so long without it that it’s depressing. 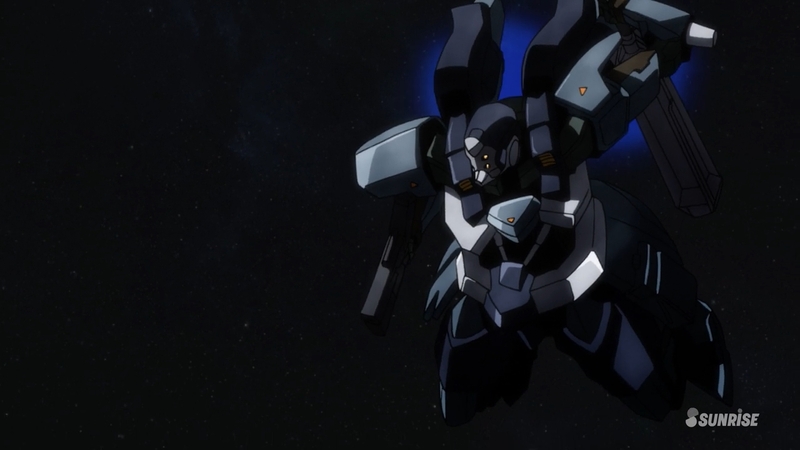 Also, is that mobile suit with the shield from the preview the new Gusion? Wow…they really changed it a lot if that’s the case.